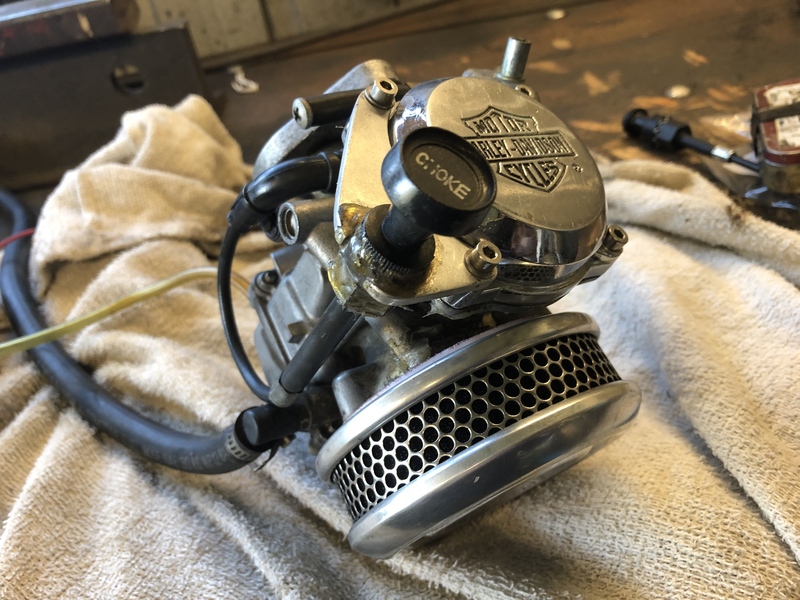 Discuss and show your current or planned project here. 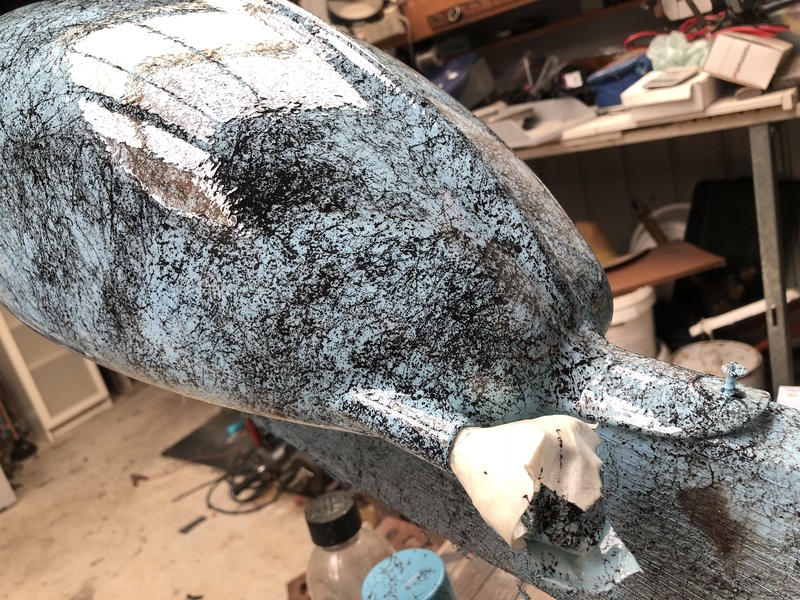 I’ve got some good things done in the last week or so, but am afraid to say made a bit of a mess of the oil tank... the idea of smoothing inbetween the fins with urethane sounded good, but i was disappointed in the execution of it. To make things worse, the urethane is going to be impossible to get out!! So right now my oil tank is in crisis, trying to figure something out before a custom bike show next Saturday!! Nothing like deadlines!! Some wins in other areas though so I’ll go through those. First up was to repair the petrol tank paint where the fuel tap leaked a while back. 2pack clear is fuel resistant, but the fuel got underneath and blistered this whole area. 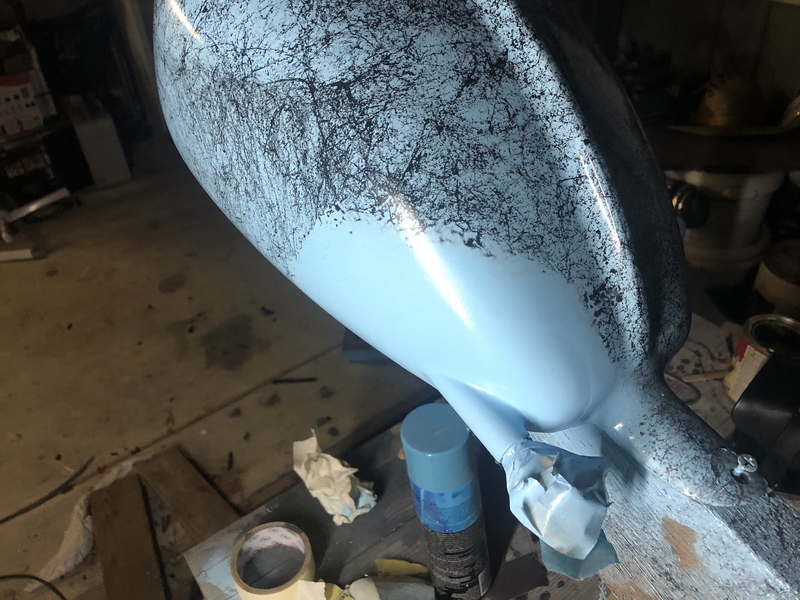 I found it more difficult to do paint repair than a whole new piece, particularly so that it is unnoticeable. Cleared in 2pack again. Good result I think. 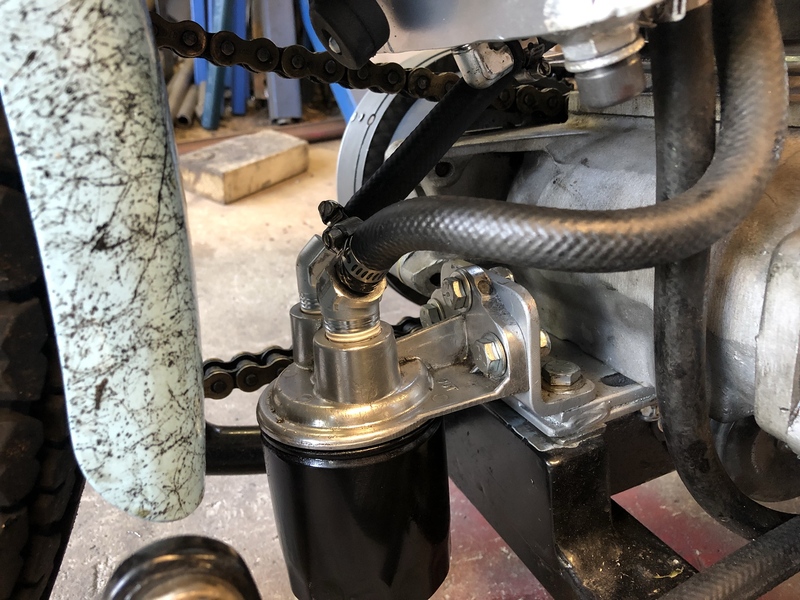 Next, oil filter mount fittings. I had straight fittings before but the bends were a bit extreme for the oil lines, here they are replaced with 45 degree fittings. 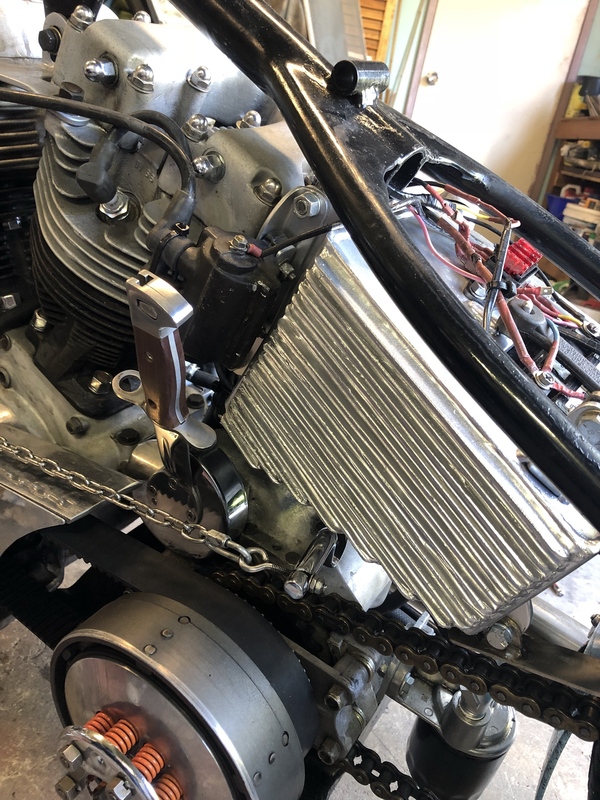 Onto the carburettor. About 4 years ago the plastic housing on my choke cable broke, and I glued it back together with epoxy. Crude but it worked for that long, until the choke would no longer hold itself on. 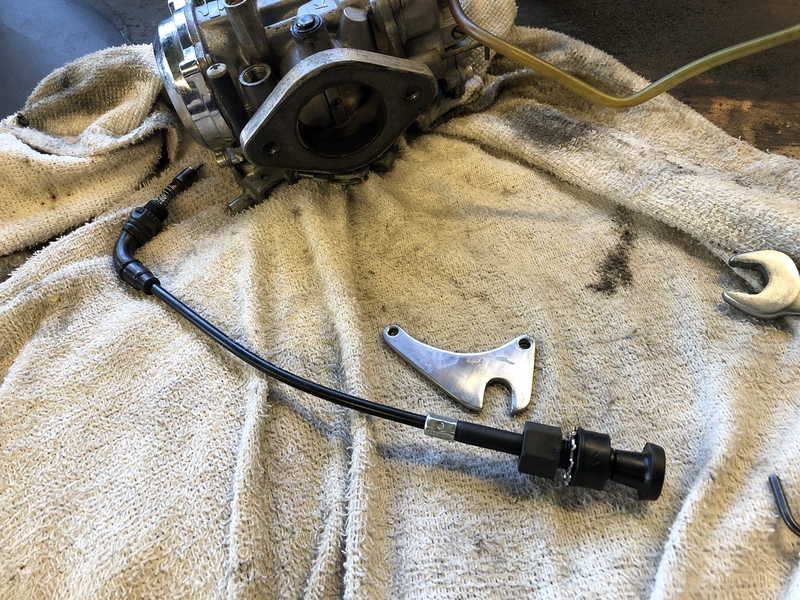 Note that on a CV carb it’s not actually a choke, its an enricher circuit. Old cable broken off, plate cleaned up, and a new cable ready to go on. Cheap part, should have done it ages ago! Between wheeled & house projects, I tend to spend a lot of time looking around bunnings, and often surprise myself what one can find and improvise with. Like these solid polished brass knobs, $2.50 each. 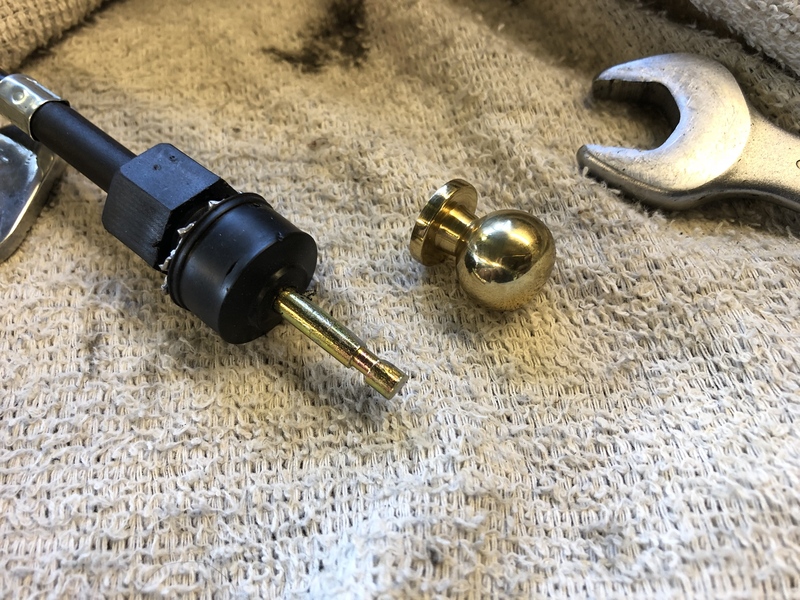 I ground off original plastic knob, and drilled out the new brass one to fit over the cable shaft. 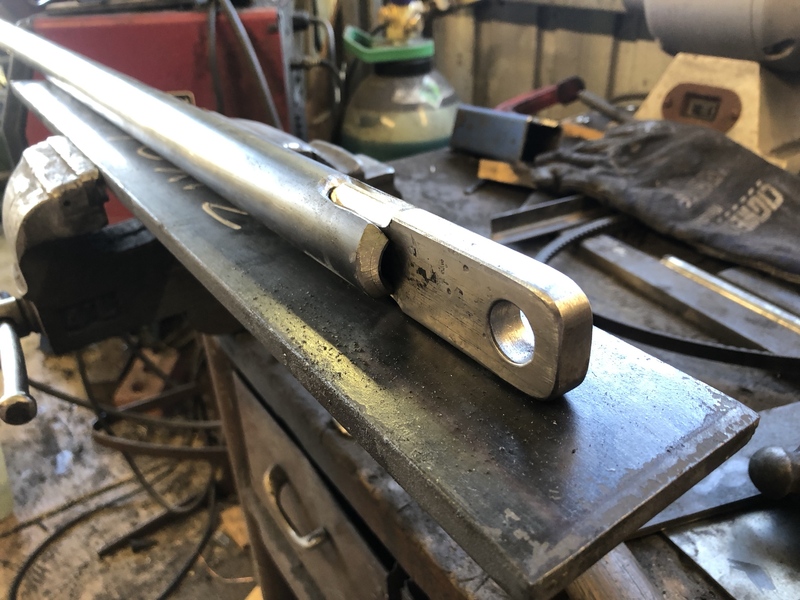 6mm round bar with the end centre punched by eye. 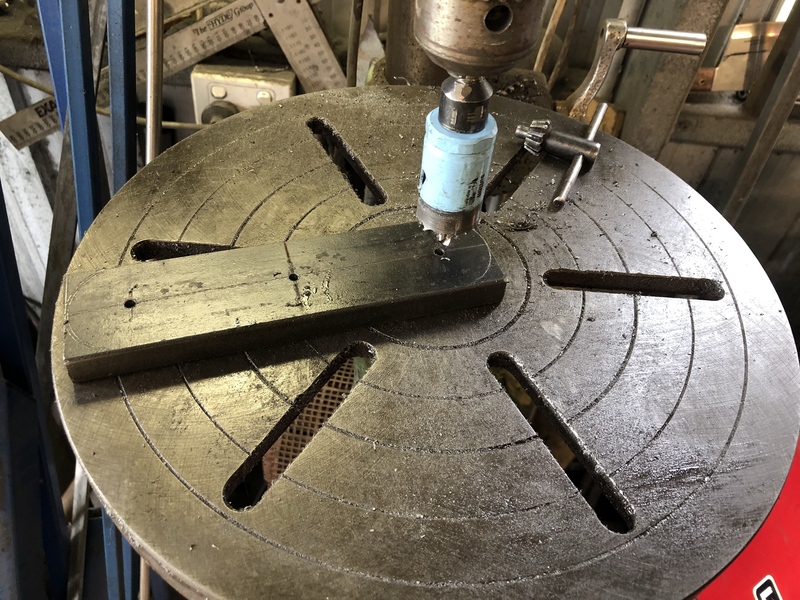 Now mount the round bar IN the chuck of the pedestal drill. Once it’s chucked up, clamp the other end of the work piece tightly in the vice and loosen the chuck. Now chuck up the intended drill bit, and gently have at it. It’s not going to win awards for accuracy, but way better than you’ll ever do by hand. 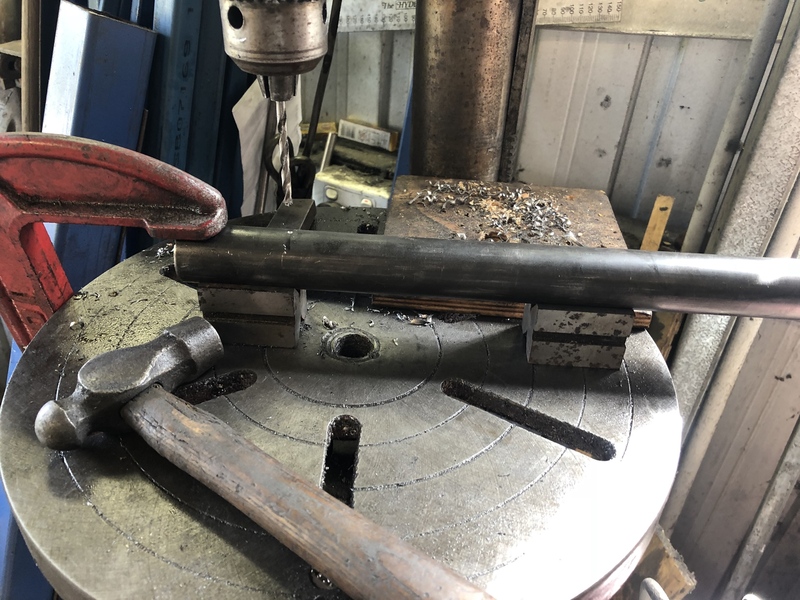 Tapped onto the end of the shaft and welded on. 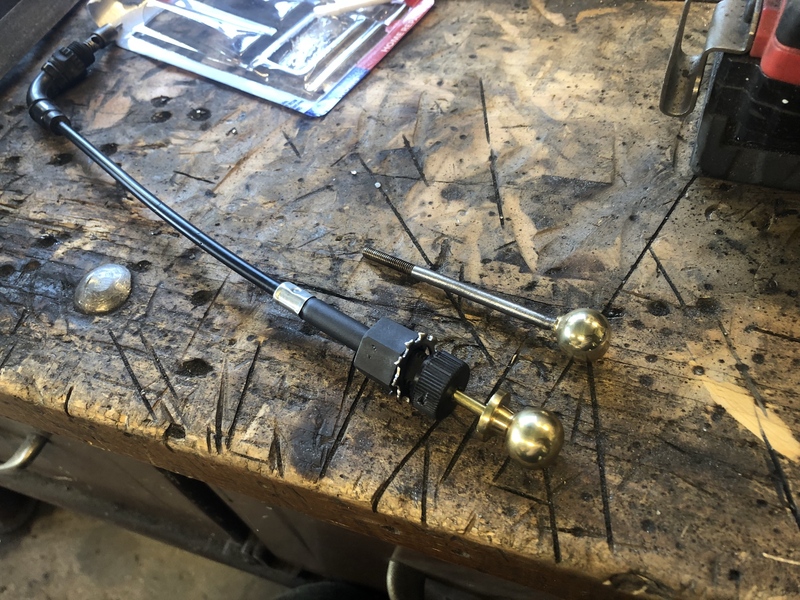 To fit the balls on to the shafts, I used a two step approach. First of all, I flattened the shafts a bit with a hammer so they would be a really tight fit. I also used epoxy inside the hole to really make sure they don’t come loose. Rightio. Next job. 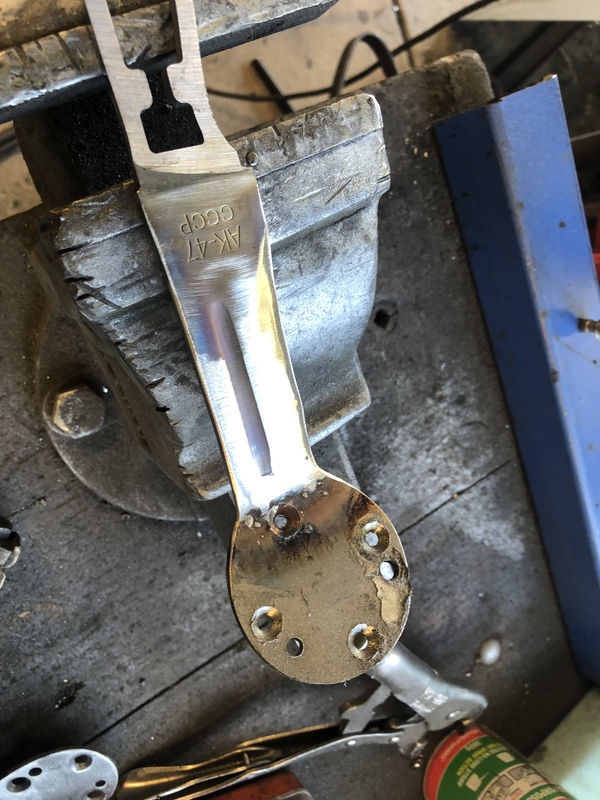 A shift lever that I’ve been thinking of for a while, finally got the right part to make it from. 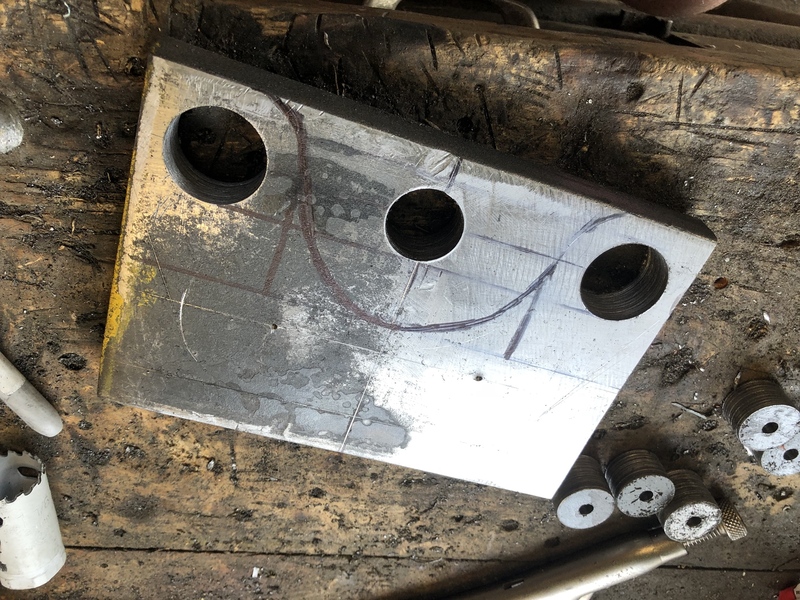 Starting with a piece of stainless plate with the pattern traced on and clocked correctly. Edges Veed and clamped up ready to weld. Might look familiar to some. 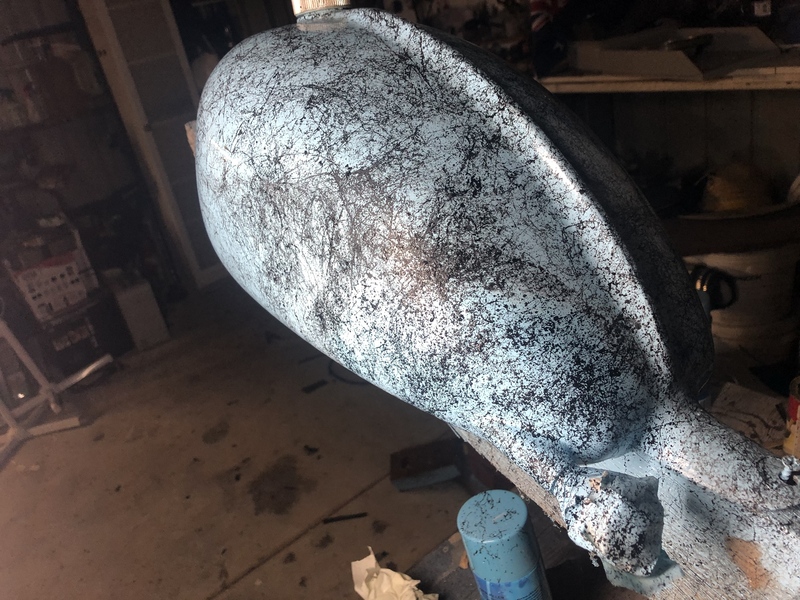 All welded and now ready to blend. Taken down with a 60grit flapdisc. Then on with the fine 240g disc. These are expensive but I don’t often polish stuff fully. Work very well though. Smoothed out and polished on my little buffing wheel. Starting to become obvious now. Boom, there ya go. Stoked with this piece. Final shot of it fitted up, just one of those details that most people will never notice, but a few will love. Oil tank looks terrible. Hope to resolve it somehow this week. 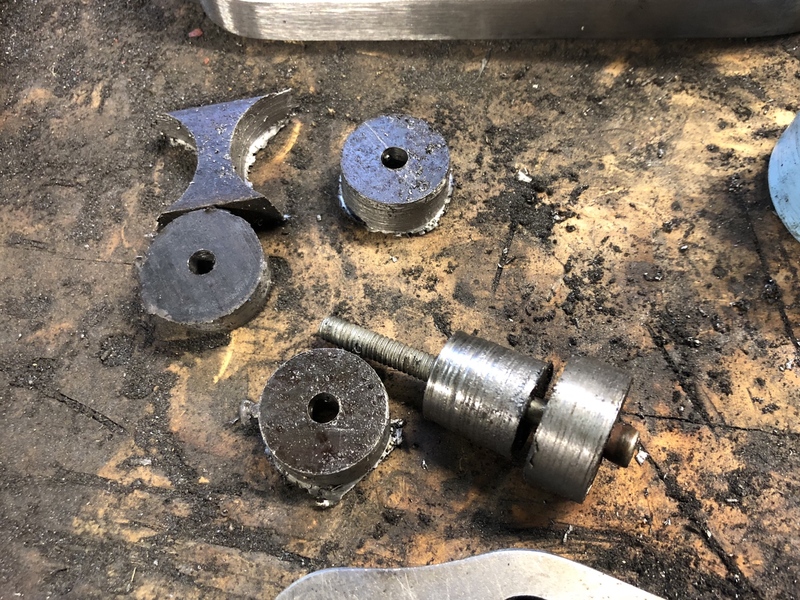 Solved an issue where my kickstart shaft had become really stiff too. Prof and I had put new bushes in the kicker cover and honed them to size. Worked great for quite a while, then for some reason started to bind up. Took it all apart, bushes looked fine but I took the opportunity to clean up the kick shaft a bit. 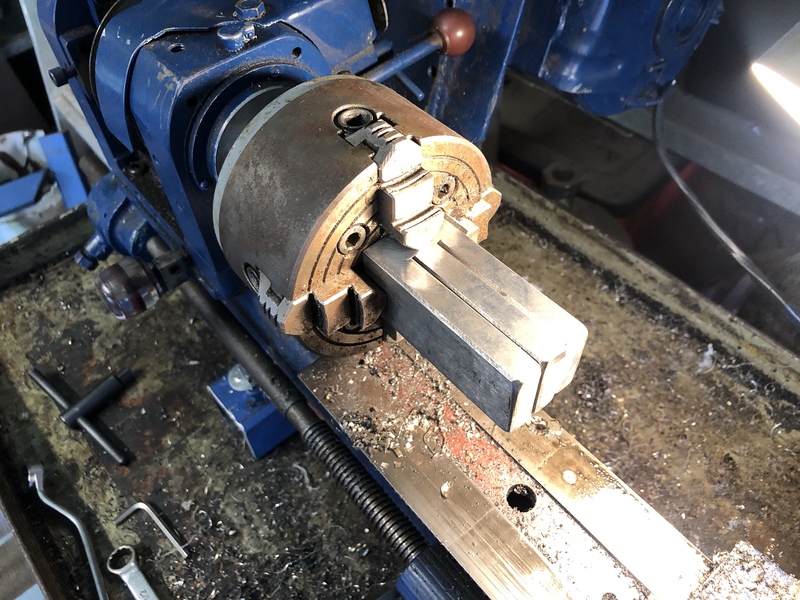 I mounted the shaft in the drill and took a bit off with some emery cloth. 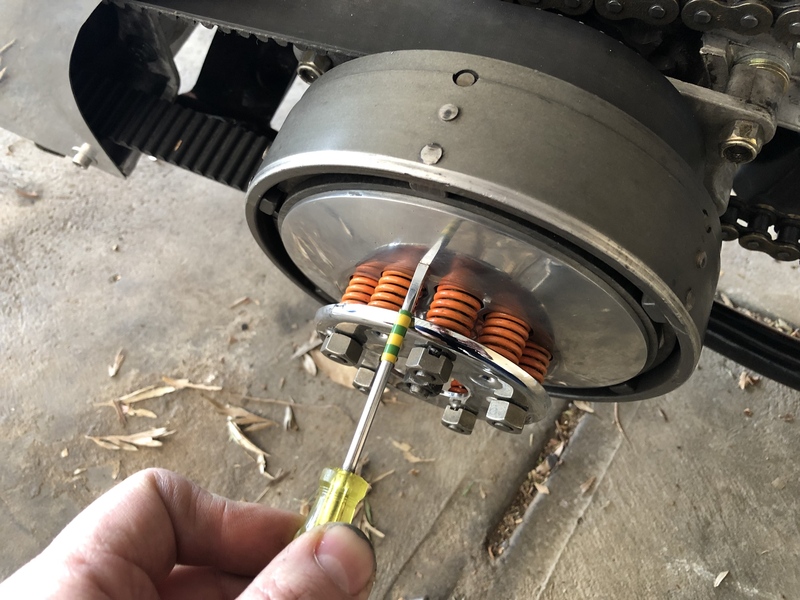 I hadn’t put enough preload into the return spring either so I fixed that at the same time. That’s it for now. More oil tank work in the week, then a whole lot of cleaning and polishing Ready for the show on Saturday. I now have all of the raw materials in stock for my springer build. Once the bike is out of the shed and less likely to have little bits of work done, I’ll dedicate time it the springer. Great job with that tank repair. You have great ideas and the skills to fabricate them so they look awesome! It's obvious you love details; I do too. That blade handle shifter is better than the 'axle nut wrench', and blows away anything you could buy. 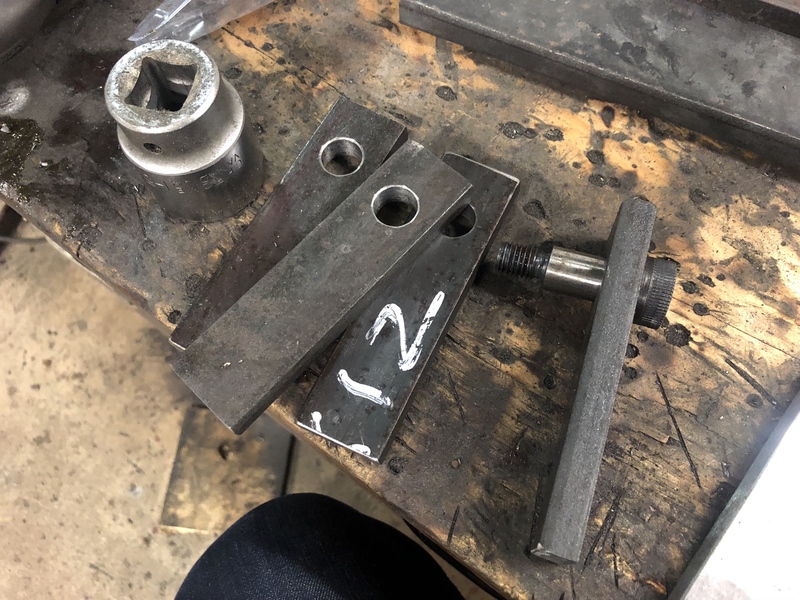 My idea for the eurethane would be to fabricate handles for a small round file and get in there...trying to think how a grinding wheel could be cut (dressed) to the shape you need and run it through each slot - kinda like cutting dadoes in wood with a table saw with a rip fence. 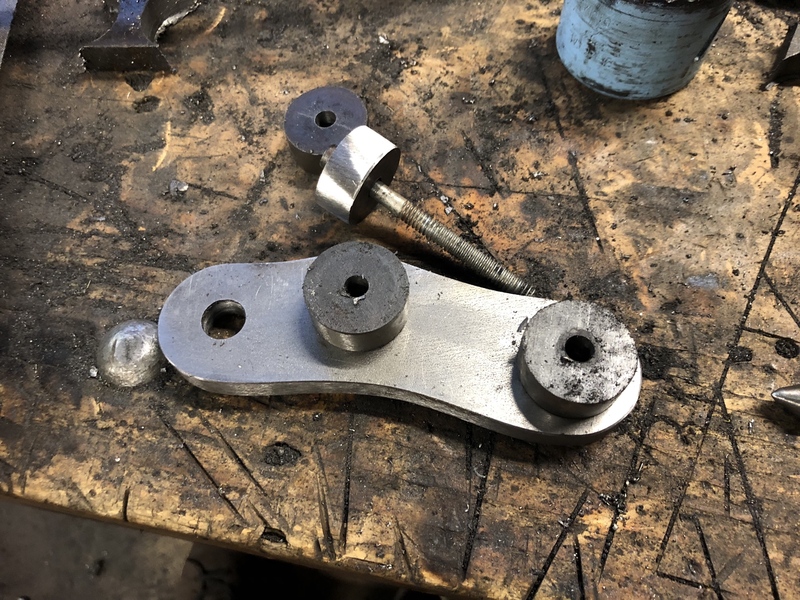 Got an idea to replace your clutch chain? Love watching your work. Taking an idea and making it happen. Very cool and very old school. 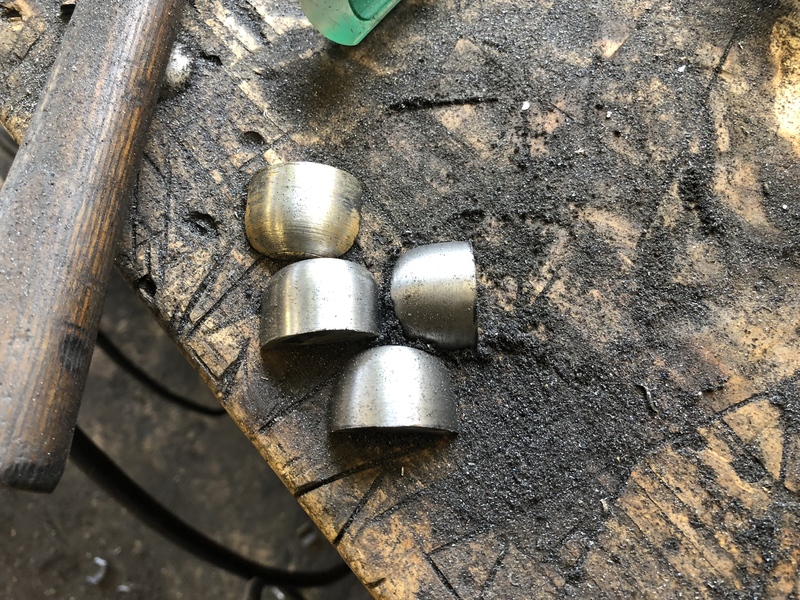 It always seems to be a mad rush to get something done in time... the latest were these Knurled aluminium footpegs, which i machined with Prof’s help the night before a bike show. 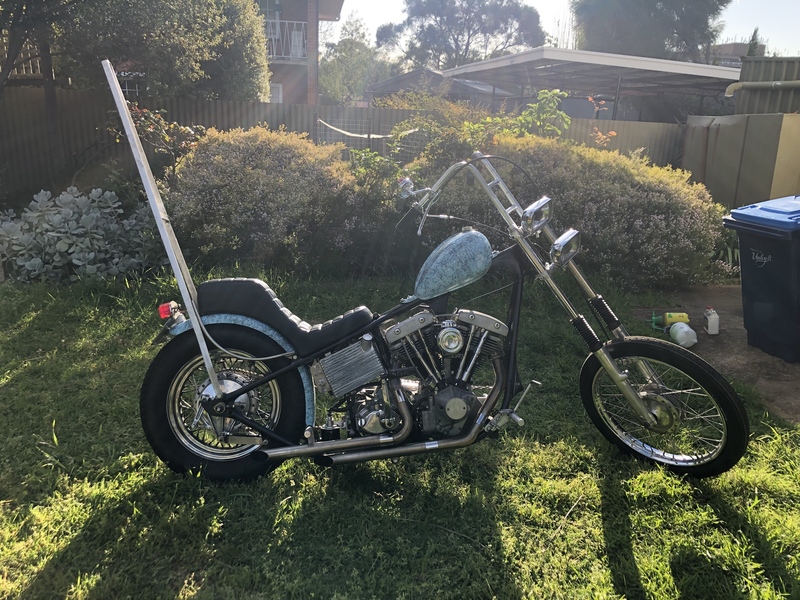 I wanted solid pillion pegs to match the front, and this is what I came up with. 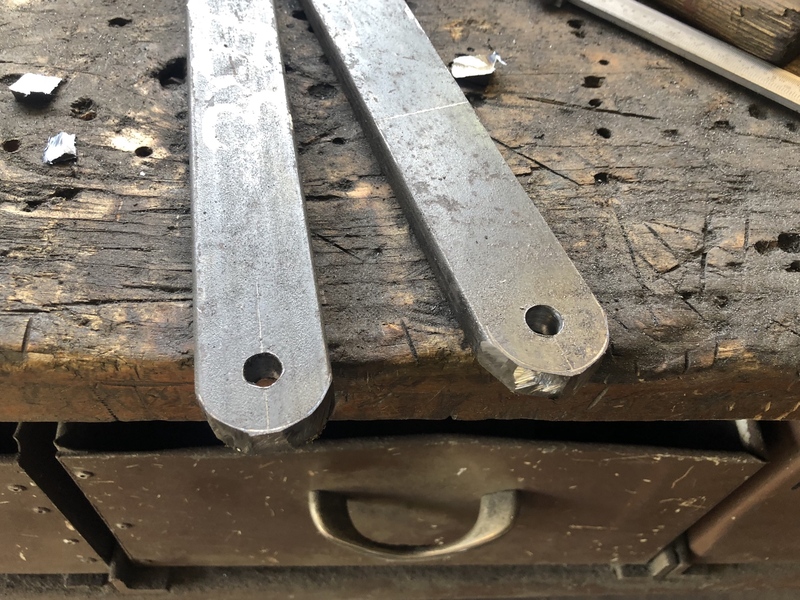 The pillion pegs are just drilled and tapped solid bar, fine because they are quite short and mount straight onto the frame. 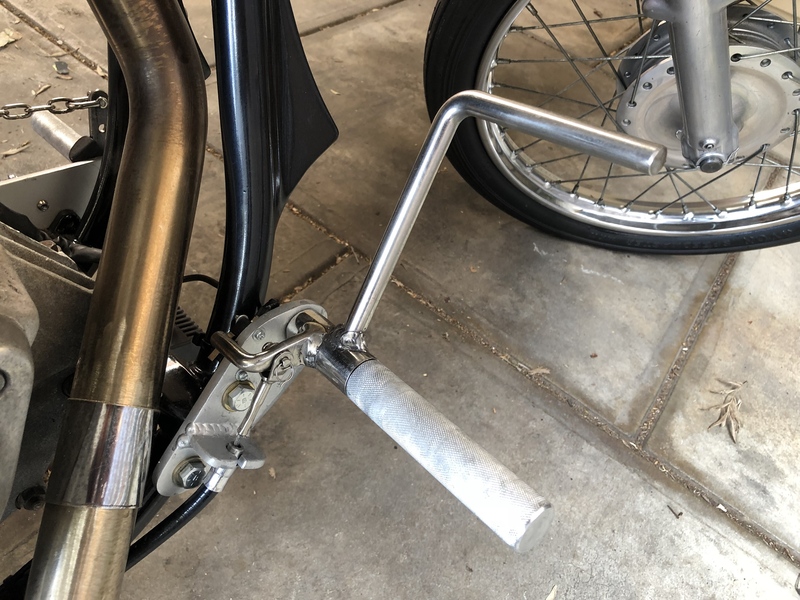 The riders pegs are bored out half their length to 16mm, with a steel shaft pressed in that provides the wearing surface for the pedal, and is tapped in the end for bolting up. 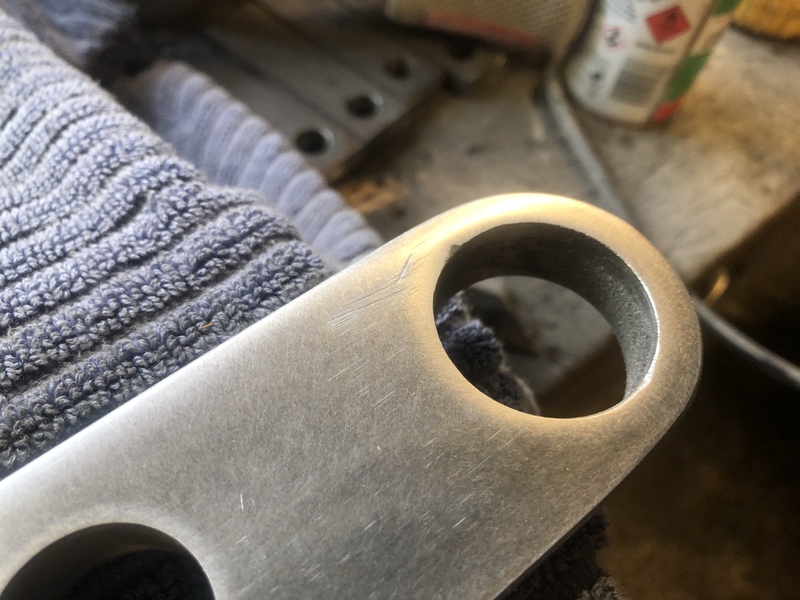 My knurling technique was not the best, but the result was definitely good enough for me. 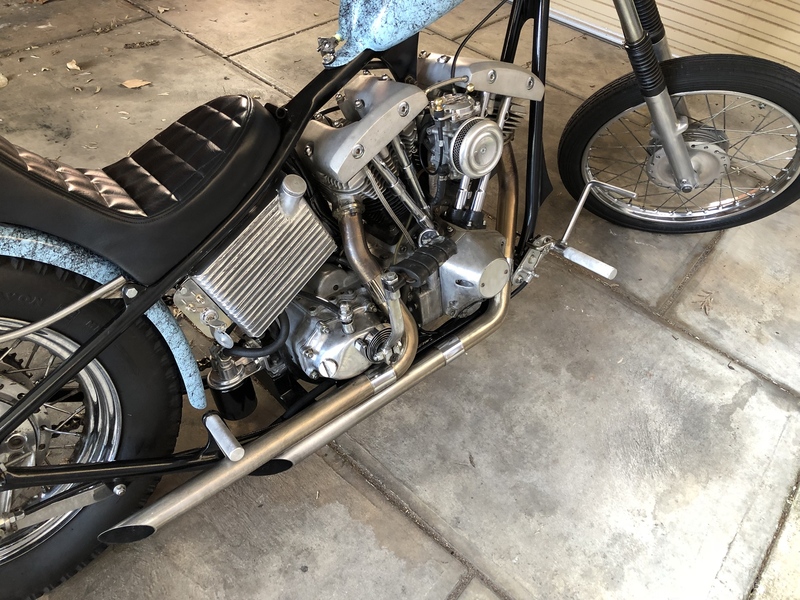 Might be getting the bike ready for a show, but it’s built to Ride! Pegs mounted up and the bike cleaned, as good as I can be bothered doing. This picture shows my pedal and brake light switch setup. The tab that pulls on the cable hooks round and rests on the mounting plate, preventing the pedal from rocking backwards. Simultaneously, the same piece is holding down a microswitch lever, wired up to be open circuit when the lever is depressed. Works great, switch is from Jaycar and easily replaced if needed. In the process of cleaning the bike I must have got some degreaser or water or something in the clutch plates, as the clutch was grabbing quite badly afterwards. Access doesn’t get any easier, I can have the pressure plate off and all the clutch discs out in about a minute. 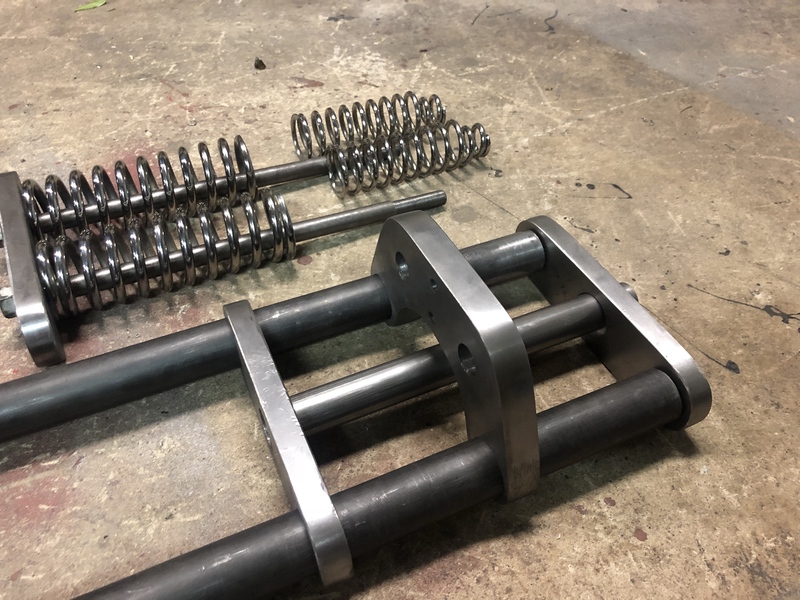 Cleaned the plates and reassembled, but need to adjust the spring plate to sit evenly. There’s a tool for this but i don’t got it handy! Screwdriver and electrical tape to rescue! Just a matter of fiddling with the adjustment until the plate is pretty even all the way round. 5-stud clutches are notoriously hard to set up evenly compared to the stock 3 stud. 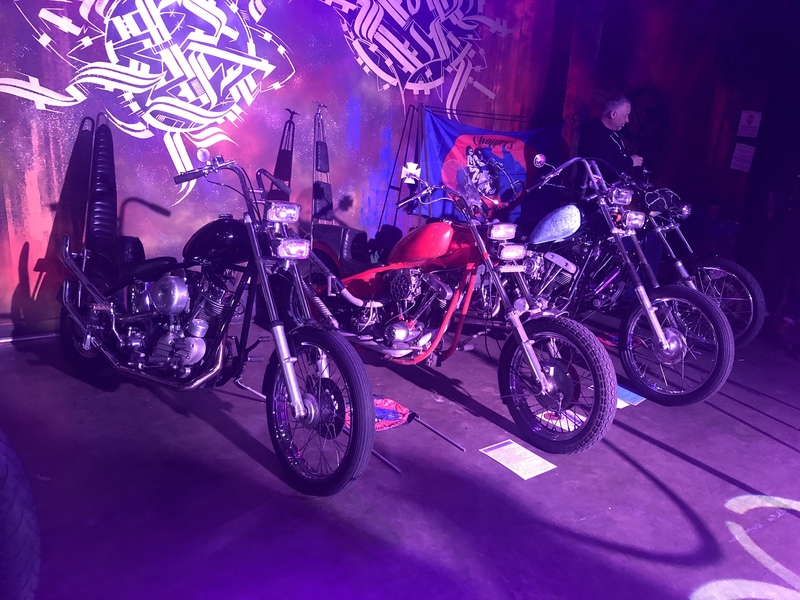 Made it to the show all fine, had a great night, didn’t take many pictures at all, but here’s 3 choppers ripe and ready to roll. Trip to Melbourne planned in mid October, A few little things to do before we hit the road. Ordered a new coil and plug wires which should pep up the ignition a little. Other job is sorting out my luggage, and sorting out a system specific for the bike and my gear. Start of the springer build. This will be a bit of a slow burn/spare time project. Bike is perfectly rideable now and it will continue to be, with this being built along side. I’ve done loads of research over the last few months and ideas have swung around quite a bit. Must have saved around a thousand pictures of old school springers, from mild to wild, built like tanks or to the absolute minimum. What I am building is a pretty typical narrow springer, built in my own flavour. Credit chopperhandbook.com , website is a goldmine of springer building information. I purchased his plans for reference but I am free styling most of this build. 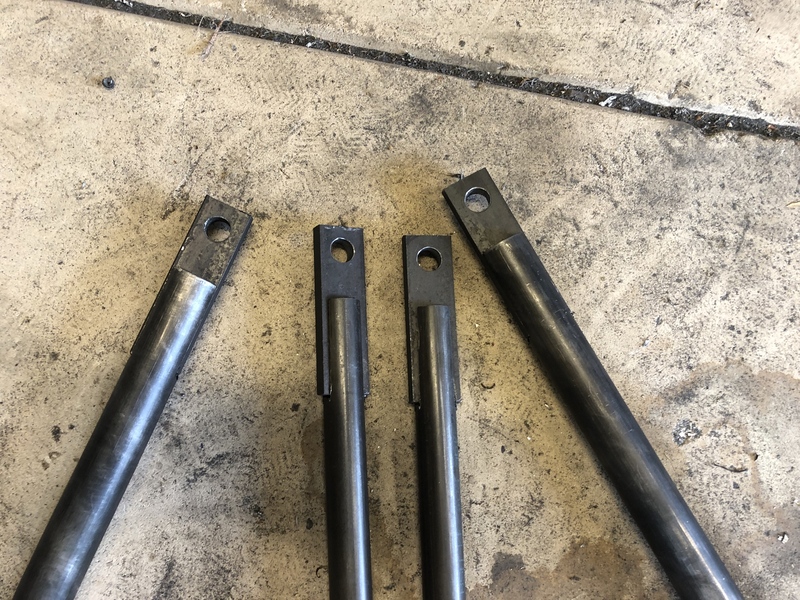 Rear legs are 1 1/4” x.120” DOM steel. 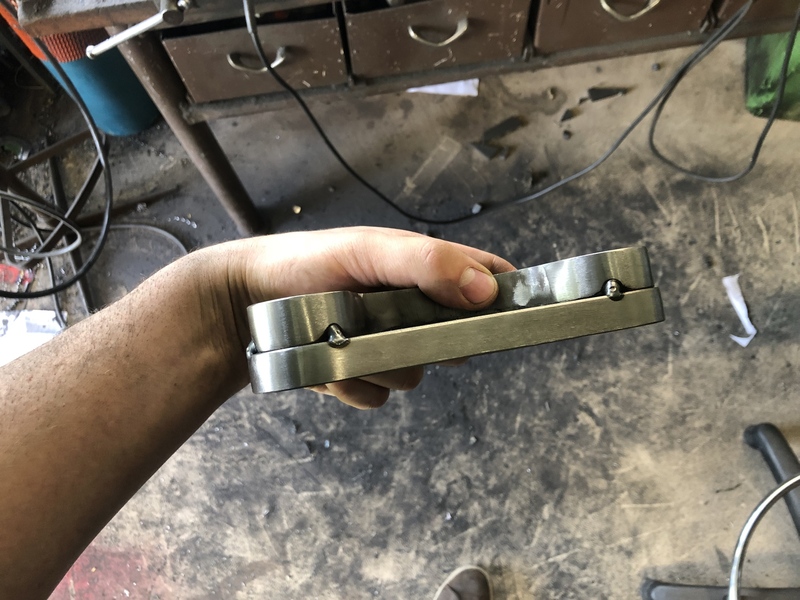 This would probably be sufficient, but I want this to be bomb proof so I am inserting a full length piece of 1”x.120” DOM which is a snug fit. Front legs will probably be 1”x120” DOM, thinner front legs look nicer though so I might change. Start by plotting out the width of the legs. After some scribble time I figured out that I could run the tubes at 4.5” centre to centre and still fit my front drum, but it would be super close and probably frustrating. 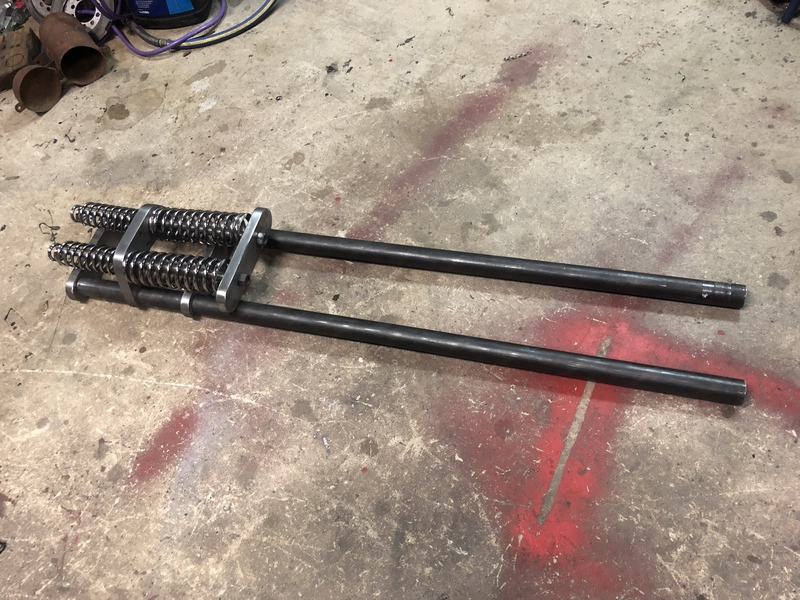 I settled on 5.5” centre-centre which is still pretty narrow and gives just enough room to mount standard 3.5” centre-centre bars using a socket head bolts. Bottom tree, 16mmx50 flat bar. 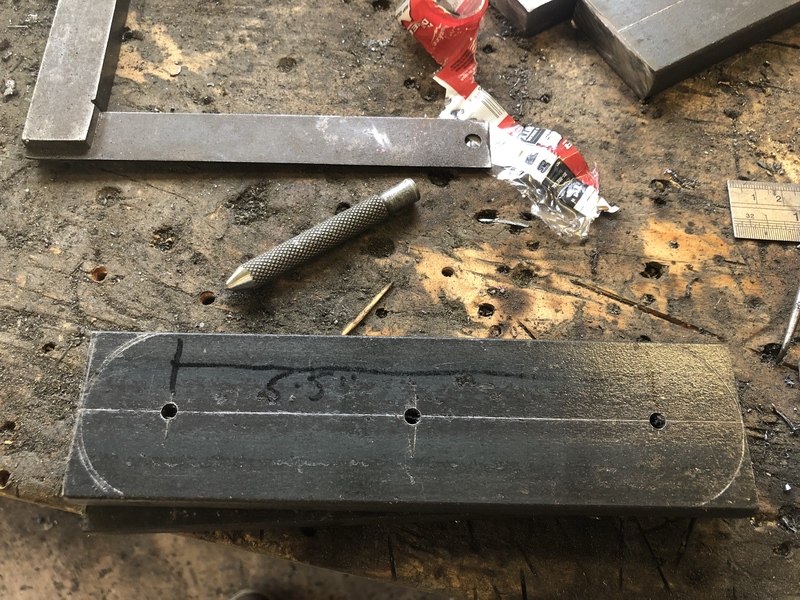 I’m making things really difficult for myself using hot rolled steel, but it’s readily available and much cheaper than cold roll. This will be fine but it just needs loads of work before I can even consider chrome plating. Holes drilled out with 4mm bit and transfered onto the other two plates. The large plate in the back is scrap of 20mm plate, luckily I was still able to use it even though it was a hair too narrow and already had a random hole in it. Slightly undersize holesaw set up in the drill press. People underestimate good quality holesaws, even this one is just a $20 bit from bunnings and it happily did all the holes for this project. Holesaws always tend to make an oversize hole, in this case i was maybe a bit too cautious and it left me with about 30.5mm .. so I need to take out another 1.3mm somehow. Should be able to get an extremely accurate fit which makes for a self-jigging fork. 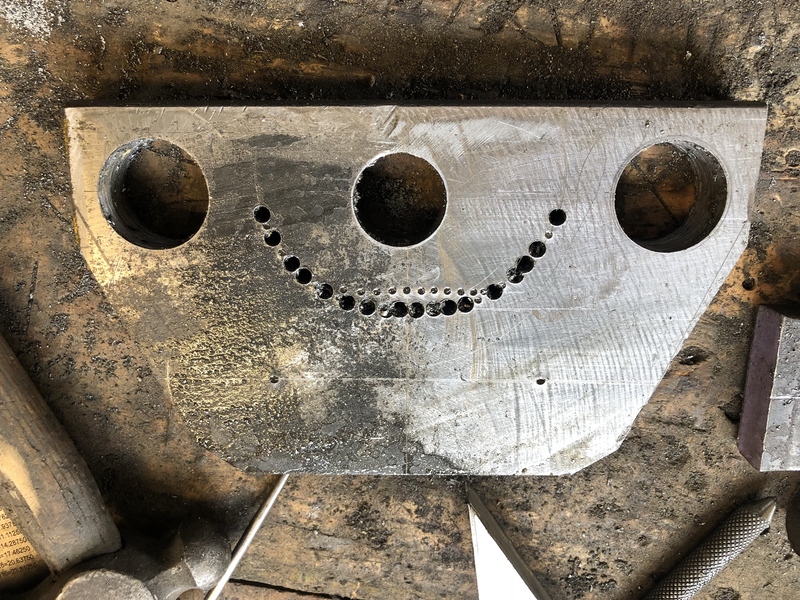 Spring plate with the main holes knocked out. You can see the remaining slugs behind, I keep all these and have a box full of them in various sizes. Comes in handy from time to time, Especially without a lathe. Plate rough cut to shape, no holesaw big enough for the inner curve so back to basics - a bunch of holes close together and then brute force. And spring rods once I figure out what I’m doing there. 12mm Top tree will be scrapped - Need to get a wee bit more 16x50. 12mm would probably be fine for both trees but 16mm just has a bit more meat on it. That’s all for a lil while. I need to build my linishing machine before I can get much more done here. It’s a vintage Raleigh linisher, made in England. Had it for about 5 years and have never got around to making a stand for it and hooking up a motor. Too many jobs, not enough time!! Moving along well and very traditional. I started the other end, with a set of rockers. Will be interesting to see how the two different springers ride when done. Hole saws can be a bit inaccurate. How close did you end up getting the back leg holes? I picked up this old linisher at a swap meet years ago, never got around to setting it up. I guess you could say i still haven’t gotten around to setting it up, but it’s working!! Linishers are amazing, the finish on steel is great. This is not a permanent setup but today I just wanted to build springer parts and not machinery!! 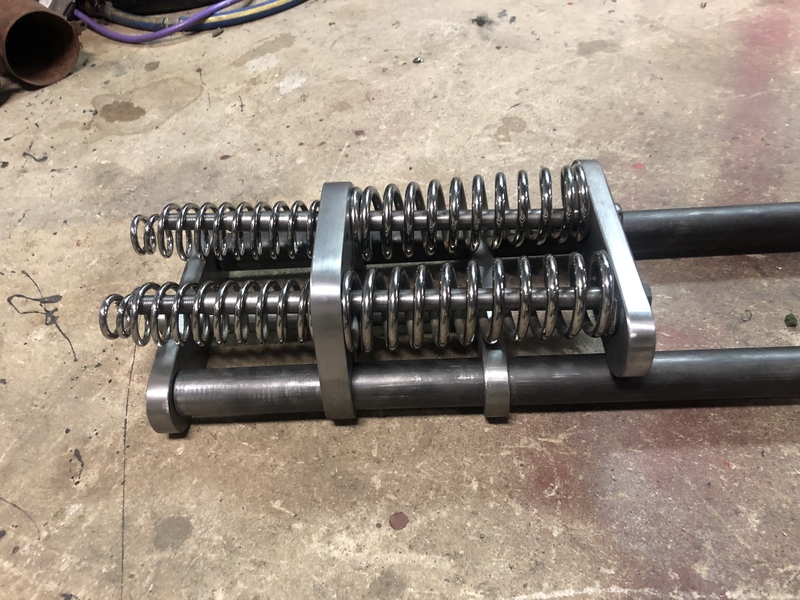 Spring plate, 20mm steel. I need to use a smaller belt sander to clean up the inside curve, radius on this one is too big. 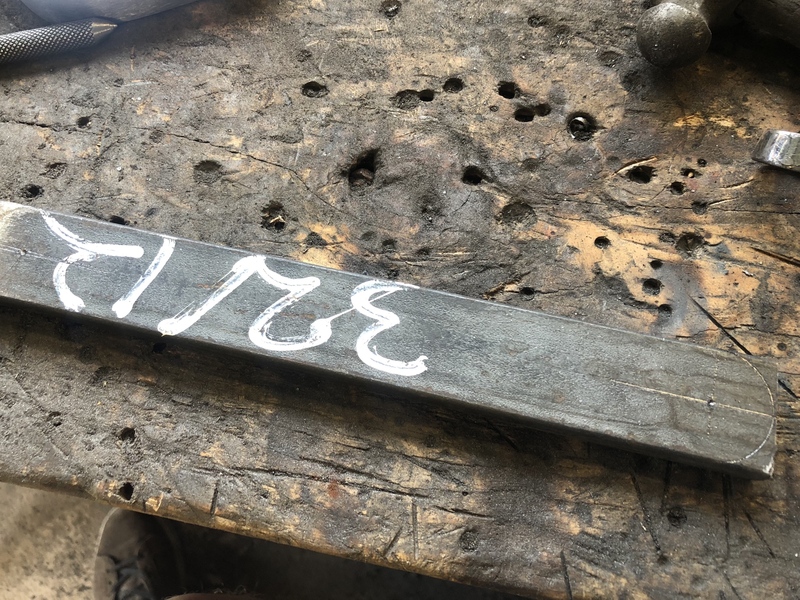 Lower Tree, 16x50mm flat bar. Drilled for rear legs. 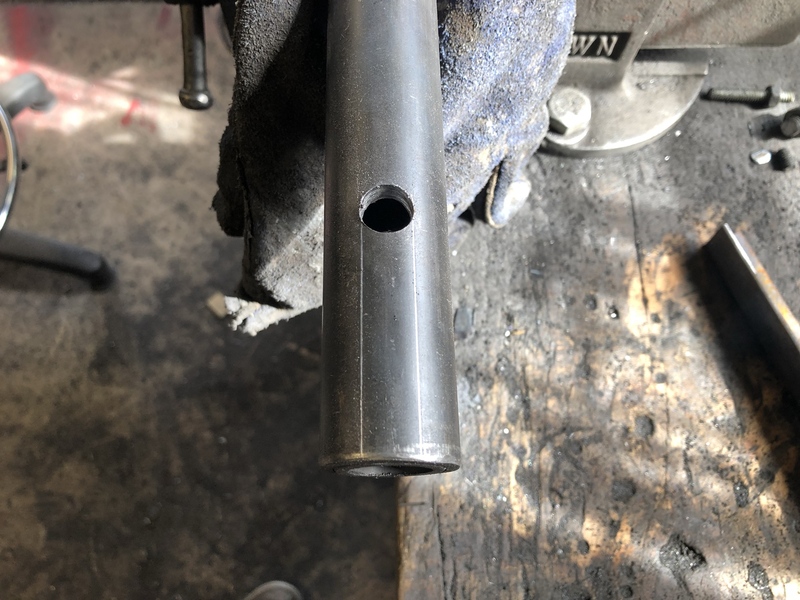 I have drilled the neck stem hole to up 18mm. 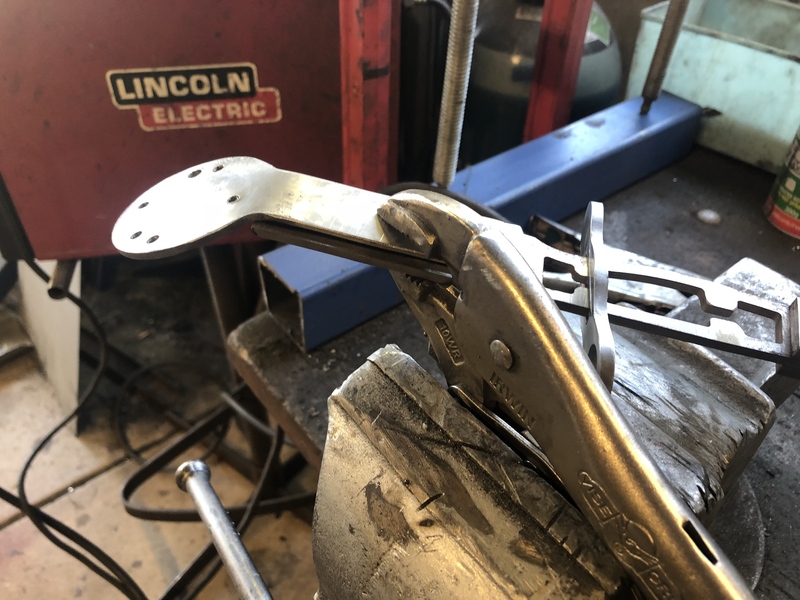 It will be taken out to a larger size just under 1 inch, and I will turn down end of the steering stem to press in and weld from the underside. Top tree, 16x50mm flat bar. 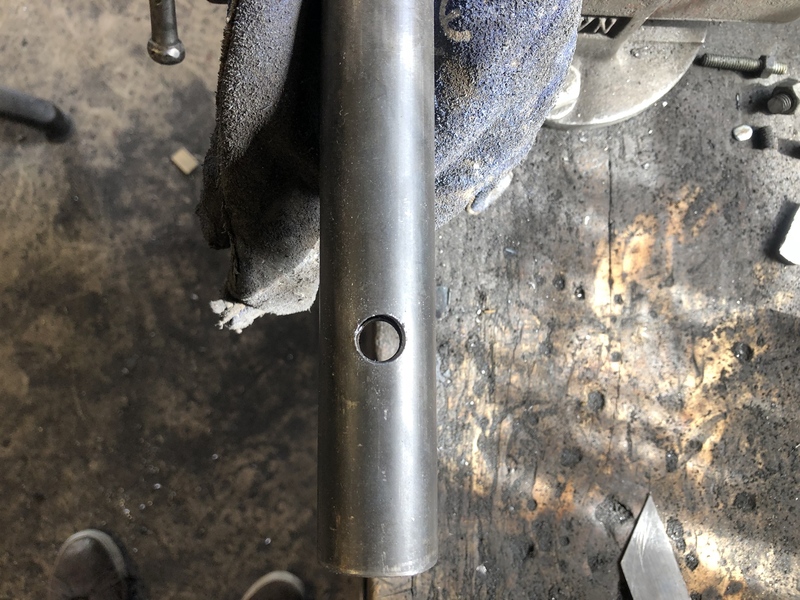 Small holes are for 1/2” bolts to thread into the top of the fork legs. Once built there will also be short tube sleeve that slip over the fork legs. Centre hole is for the 1” neck stem, but bored to 1 1/8. 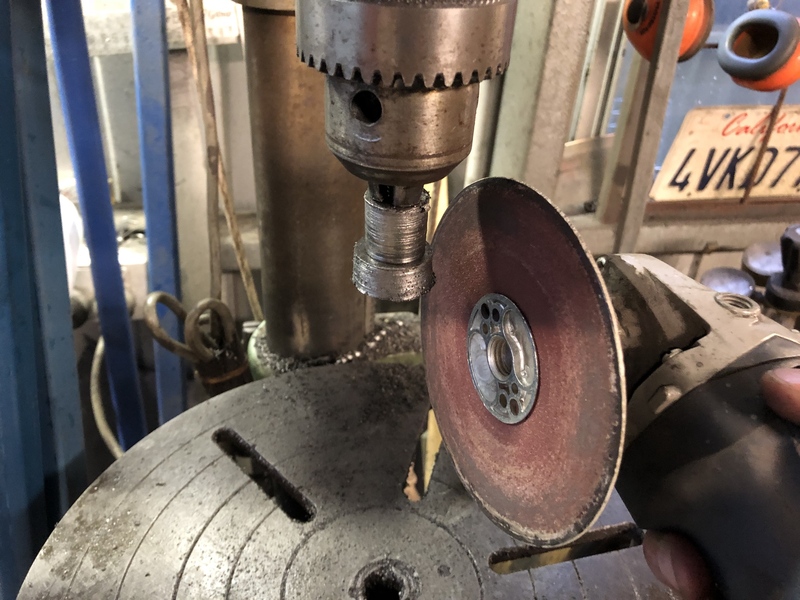 The bearing preload nut and top nut get partially turned down and locate In the hole. 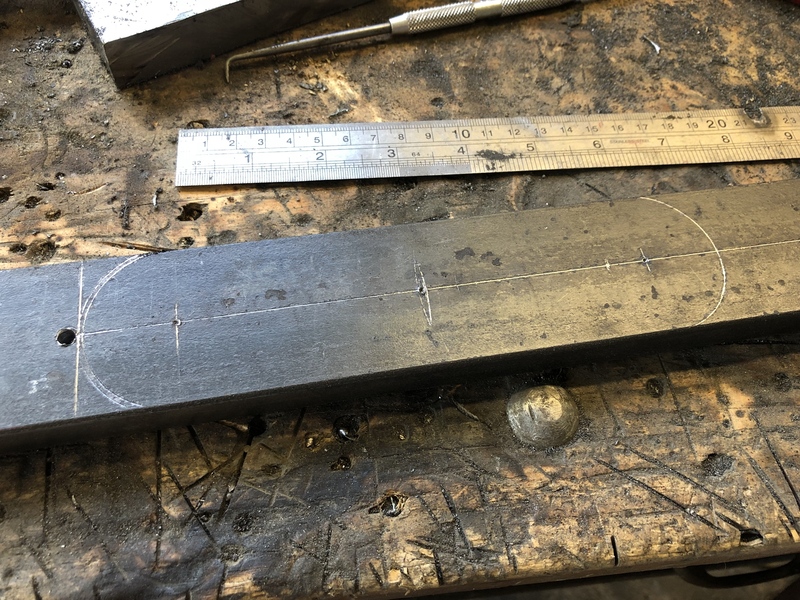 Fork ends plotted out on 12x32mm flat bar. From my bicycle days I’ll just call these Dropouts. Corners clipped off with the angle grinder. After a bit of time on the linisher and cut into 4 pieces. Drilled out to 10mm at this stage but will be taken out further once I have my rocker hardware worked out. 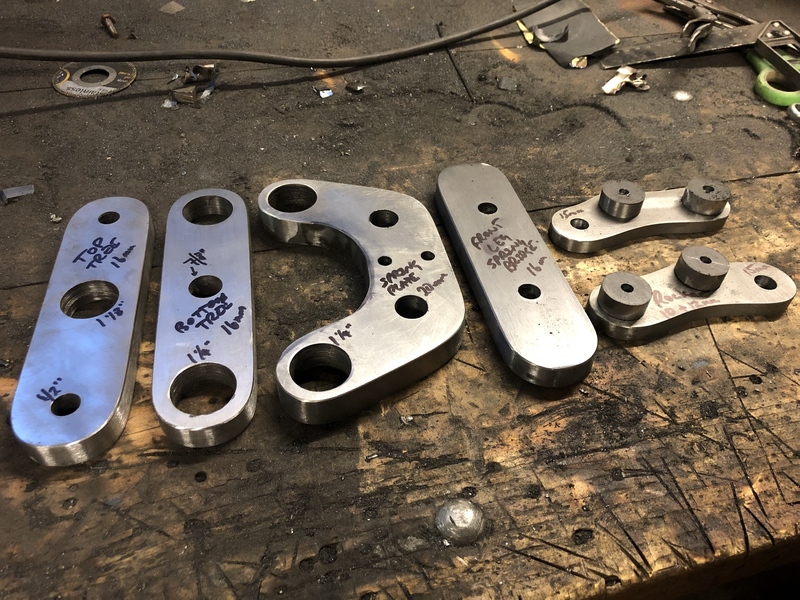 Plate parts coming together... just need rockers and a spring bridge but that requires more sketching and will happen a bit later. Stilll need hand sanding and polishing - I will be fully polishing every part of this fork before welding. The intention is that it’ll dramatically reduce my cost of chroming!! 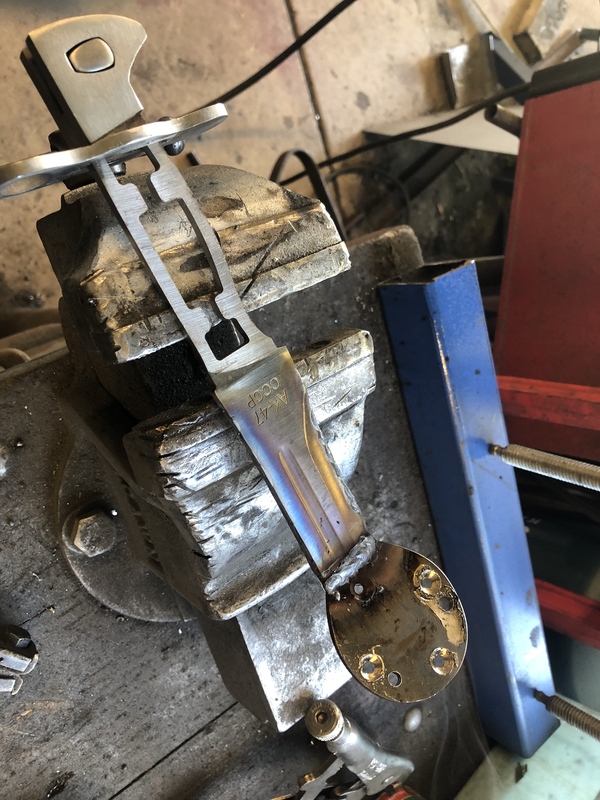 I have polished a small section of the leg tube already and it comes up like a mirror quite easily. I had originally planned to use rear shocks as my springing and damping. More and more I thought about it... 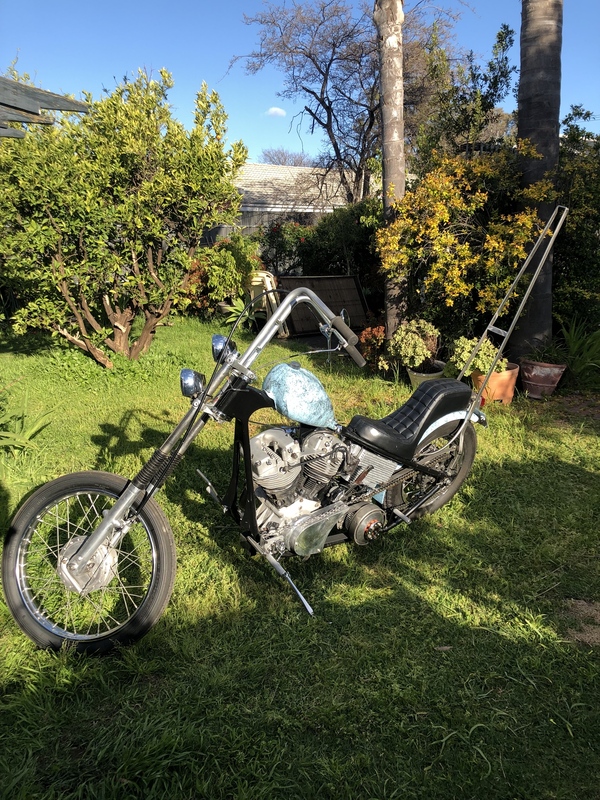 I just couldn’t pass up the classic chopper springer look. 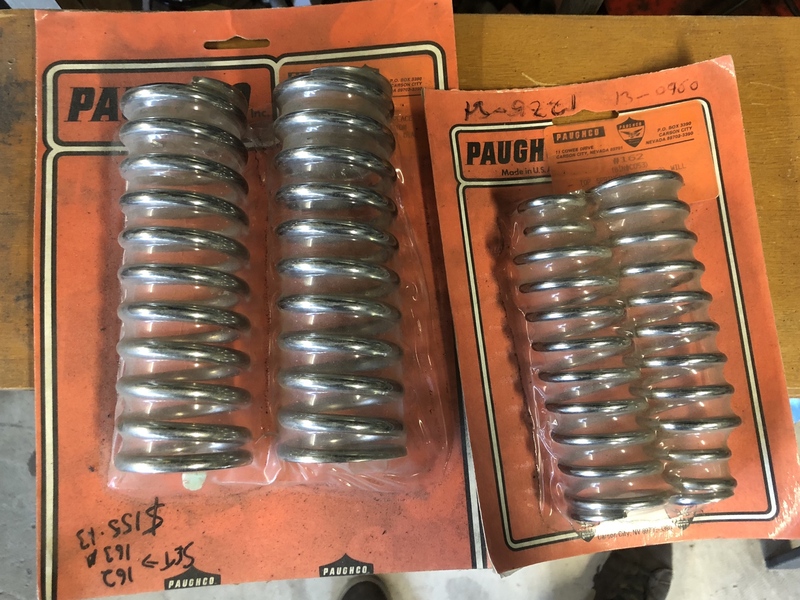 Next piece of the puzzle.... a NOS Paughco spring set. They still sell all these parts but it gets very expensive. The state of our dollar has really put the brakes on me ordering things from OS. Shipping seems to be getting ridiculous also. Finish of the day by gazing at my machine in the afternoon sun. last comment excellent. If you build a machine that you just love to look at, you can't get much better than that. 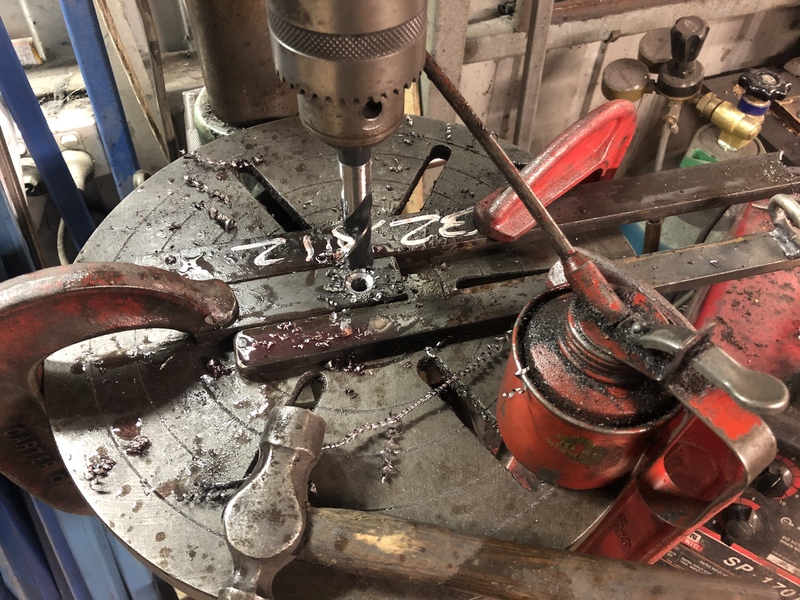 Some more workshop pics and springer bits for your perusal. 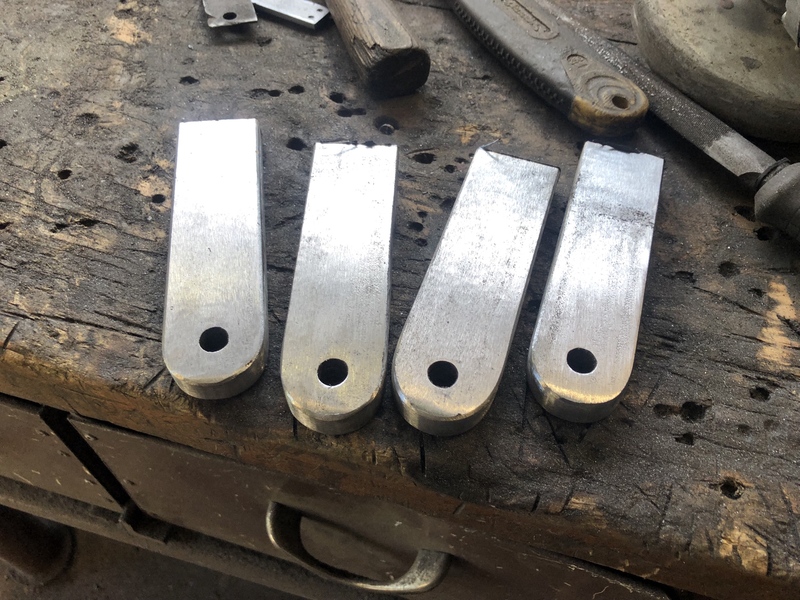 First of all, making lathe type parts without a lathe, madness you say... these were trunnions to be welded to a set of rockers. 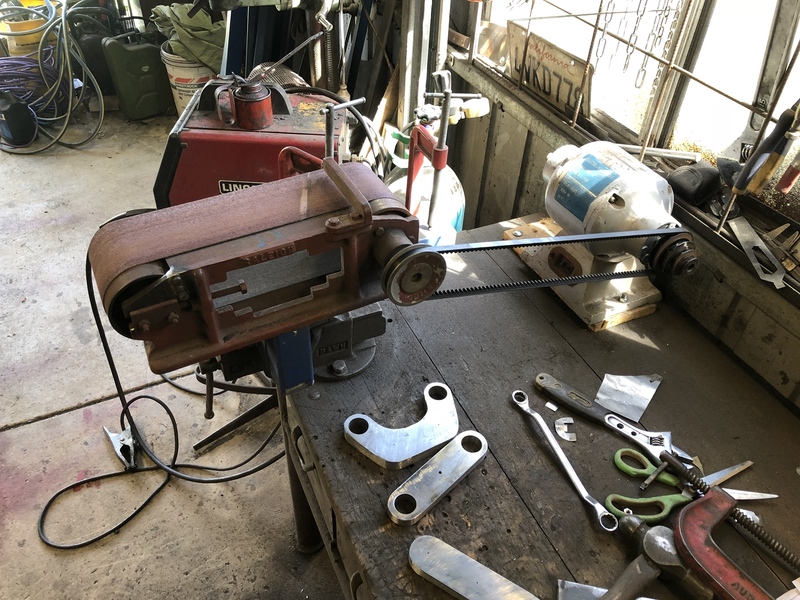 Rockers have been scrapped in the end and the trunnions were too smaller diameter, but I still kept the pictures to show you the trick. New rockers will be made in 1 piece 16mm plate. 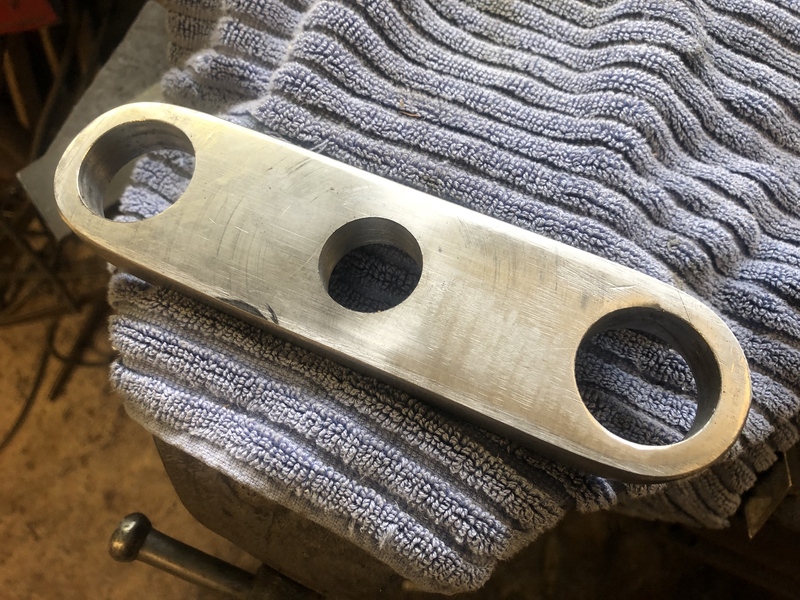 Used a 1 1/4” holesaw and some 12mm flat bar. The resulting part is a rough but round slug with 2 flat faces and a hole in the MIDDLE. 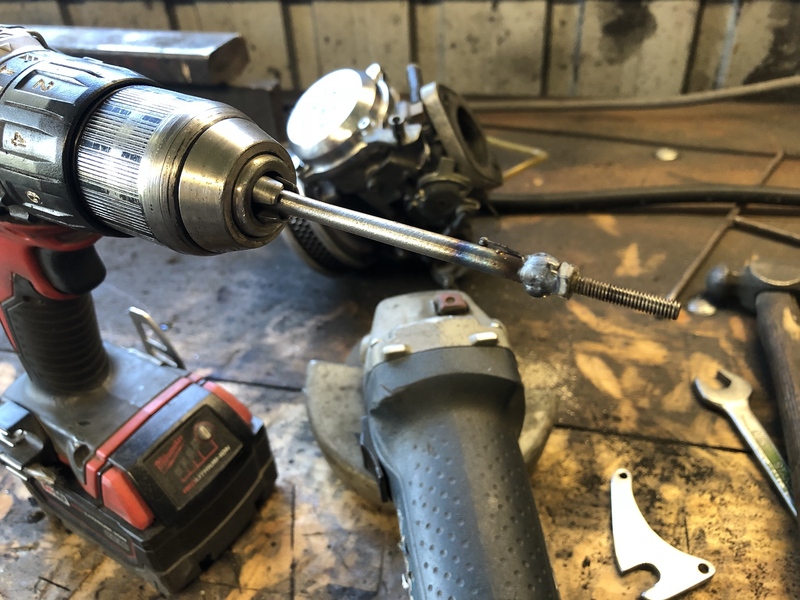 With a 1/4” bolt through the hole and another slug as a spacer, Mount the whole thing in the drill and smooth off with a angle grinder. I have recently discovered sanding discs for grinders and have been using them more and more. Can’t beat flap disc for taking off mega amounts of metal though. 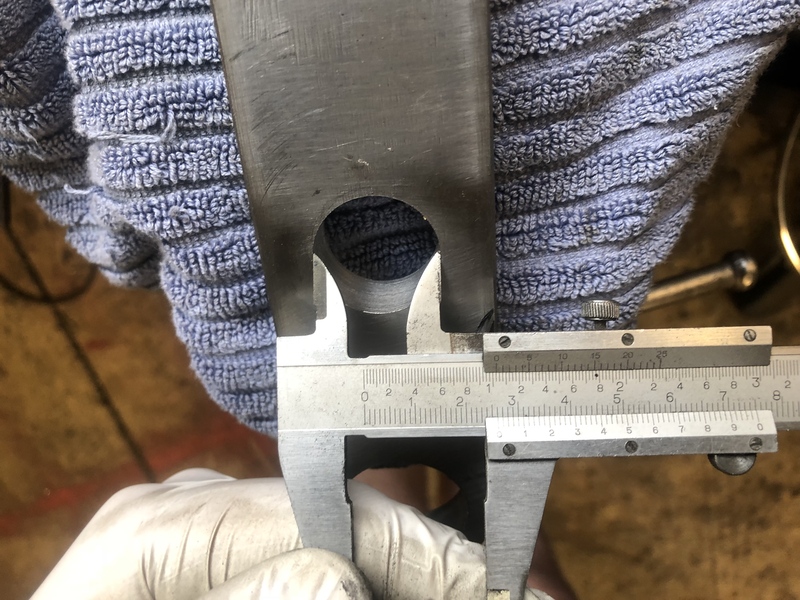 Once you have the pilot hole and the slug welded to the rocker it’s easy to drill out the remainder square and with the rocker. These were junk though, just trying to show you all. 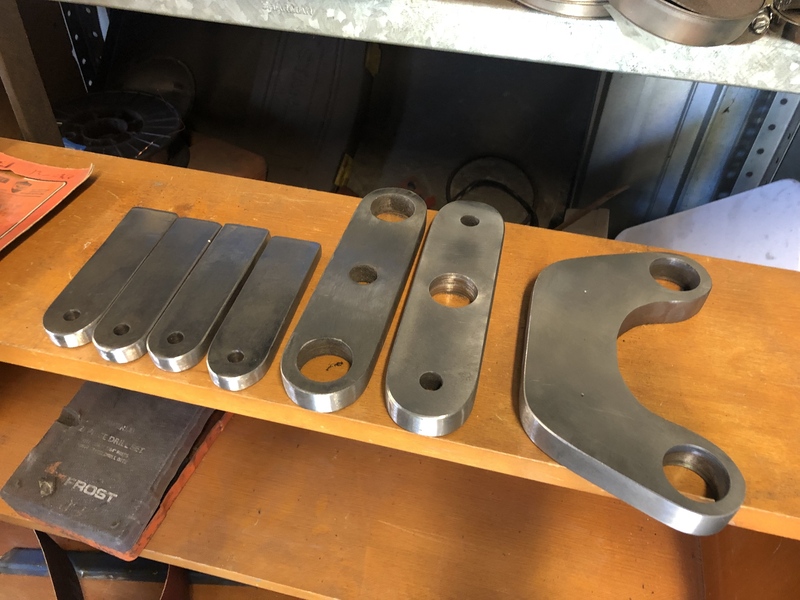 Here’s all of my springer plate parts lined up. New rockers not yet built, a few holes still needed to be drilled to final size. 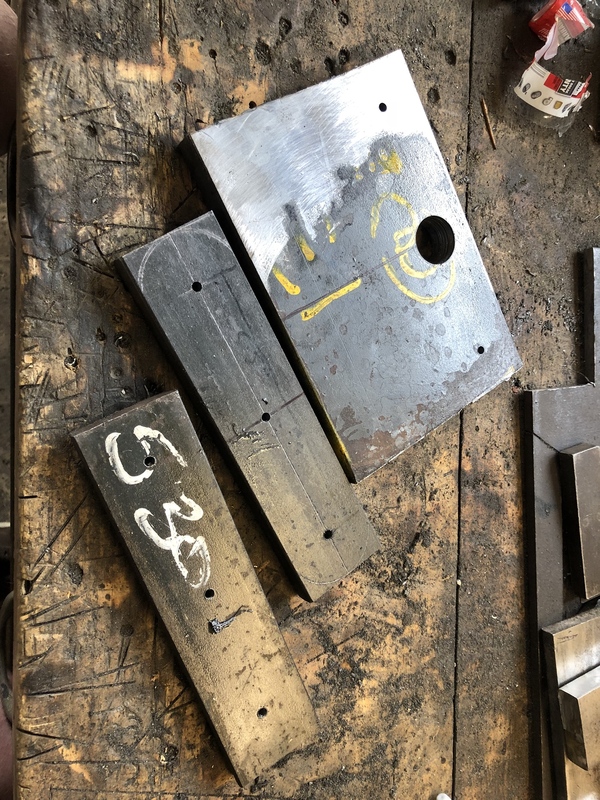 Lining up the bottom and spring tree for drilling, tack welding together so they can be drilled as a perfect pair. Prof’s help required here with his giant pedestal drill and a 1 1/4” drill bit. Jump cut to a few more parts in one place. The steering stem is junk too - I didn’t plan well and purchased 1” dia 1020 bar for the 1” stem. It actually needs to be oversize for the base and then turned down to 1” for the remainder. Learn as you go! 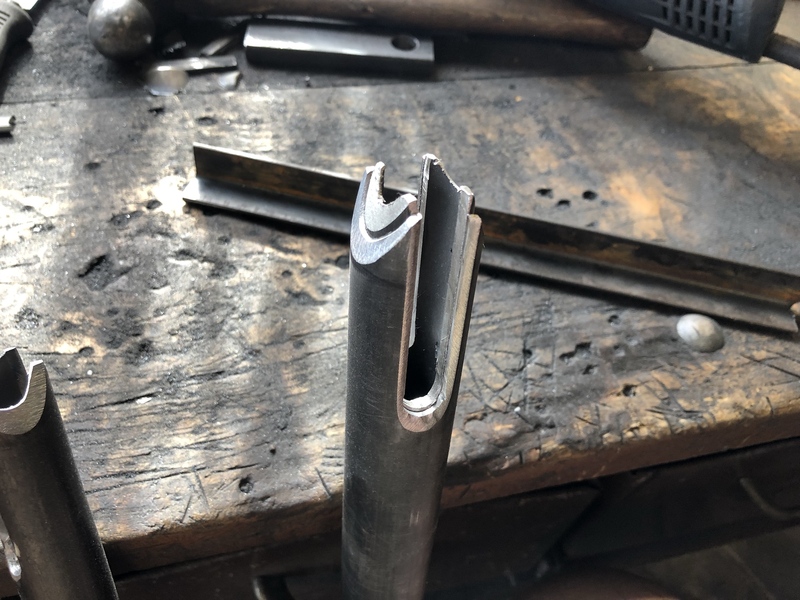 Fork dropouts I have decided to junk as well - my shaping of the round ends was not particularly precise, so I have made some new ones, keeping a bit more material in the part. Top tree has an interesting mounting arrangement designed with Prof. 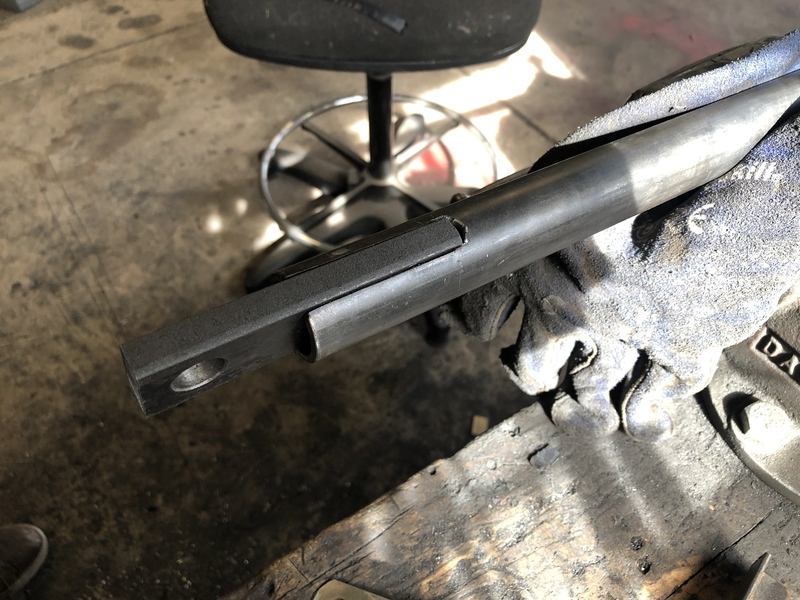 There are threaded and counterbored slugs that go into the top of the rear legs, a 16mm shoulderbolt passes through the top tree, into the counterbore and done up tight into the leg. Massively strong as any forces are now acting on 16mm hardened shafts. 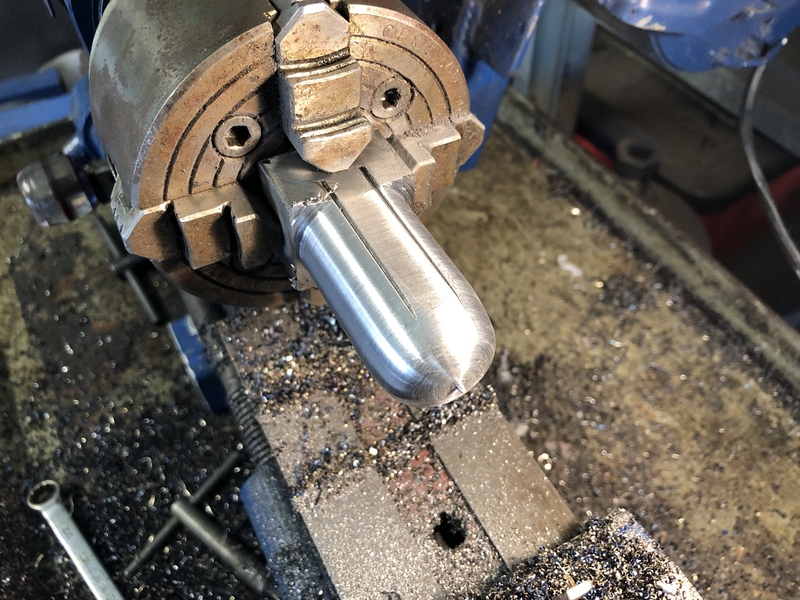 Bearings get preloaded underneath the top tree, then the tree floats above locating on the shoulder of the preload locknut and top nut - still to be machined. 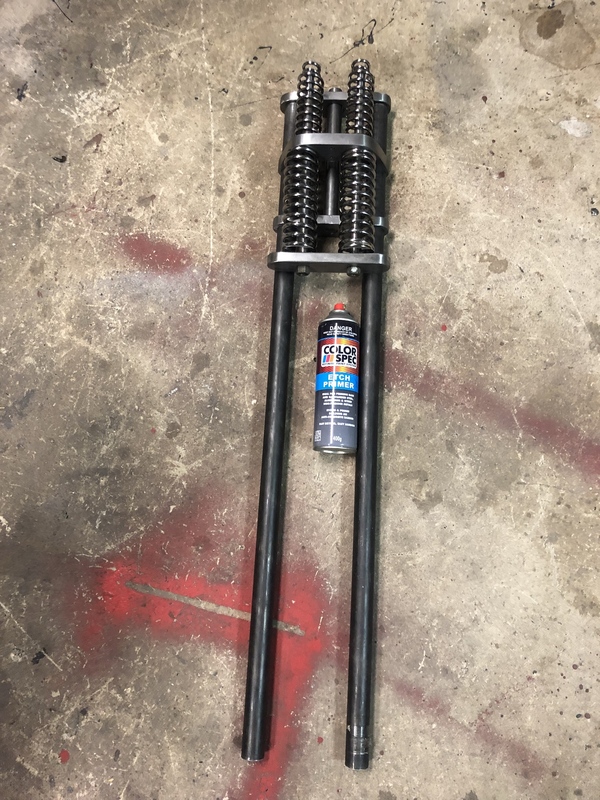 First dry assembly!!! No front legs obviously and everything is tight fit that needs tapping together. Beauty of a springer is that if built with good accuracy, it’s a mostly self-aligning structure. Plus 2” or so for the dropouts is the maximum length based on material that I have. It would equate loosely to a 12” over, but I will likely cut it down a bit shorter yet. 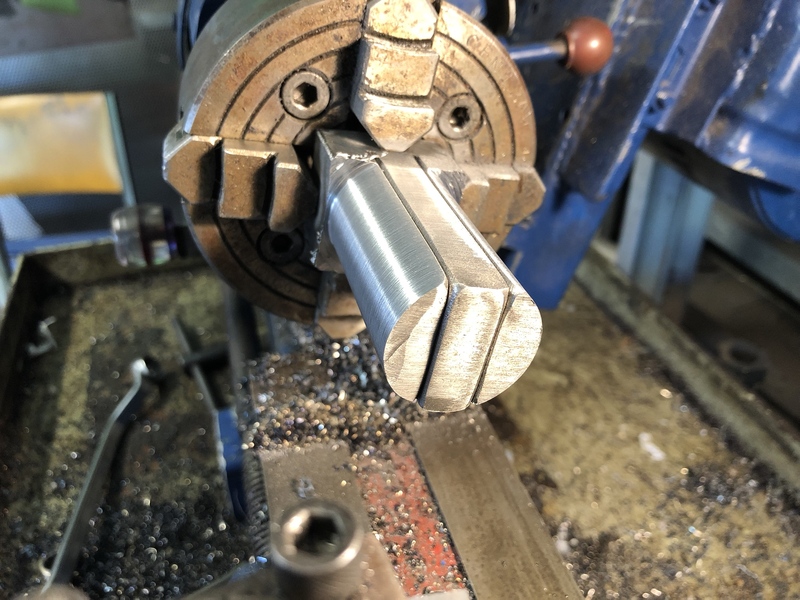 Spring rods were machined on Prof’s lathe in 14mm bright bar, threaded to 1/2” Unf on both ends. Standard size aerosol can showing the width. Still lots of sanding and finishing required on the plate parts, a long, tedious and messy process. 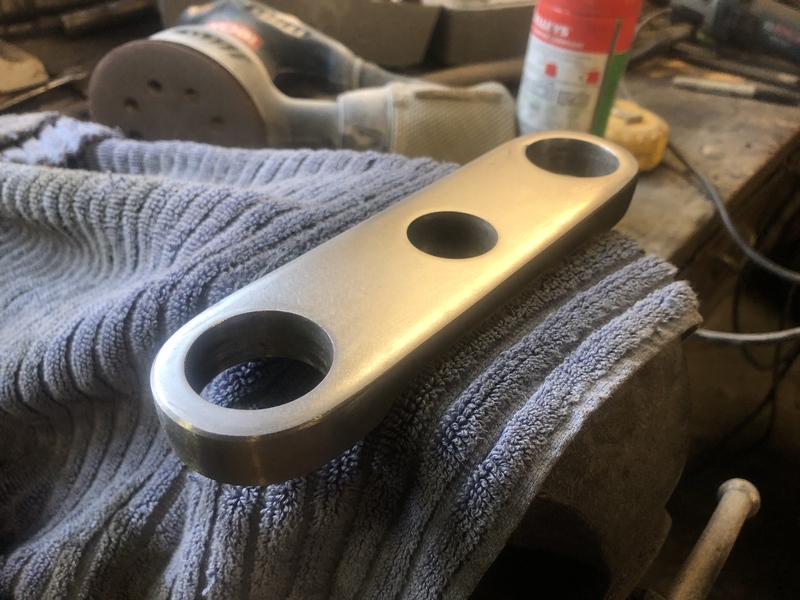 Mill scale polishes off the tube and will be chrome ready quite easily which helps make up for all the rest. Two holes drilled in between the spring rod holes are for headlight mounting. On to trying some precision drilling with an old Taiwanese still press. First step is to ensure the table is level. 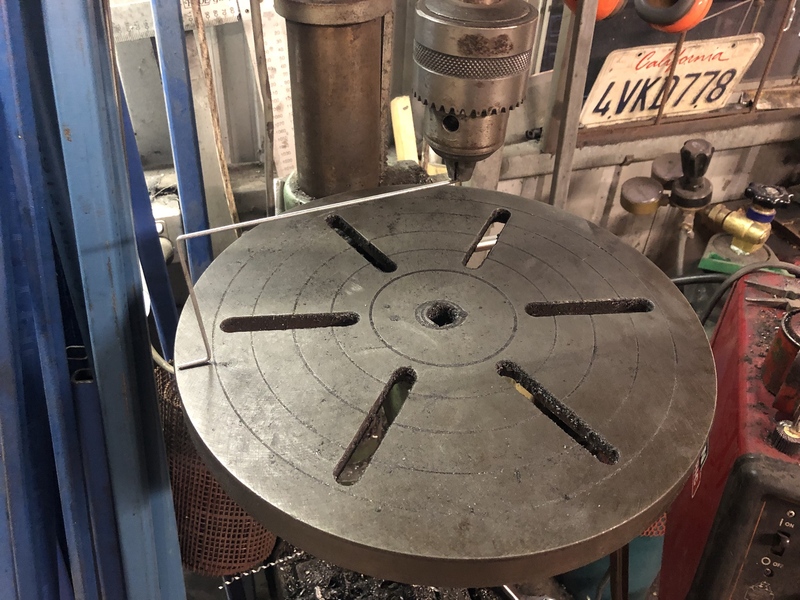 One trick is some round bar in the chuck and an engineers square against the table in both planes. I prefer this way though: a simple coat hanger bent to shape. Mount in the chuck, set the table height to “just scraping” and turn by hand. It becomes immediately obvious which parts of the table are higher and lower. Left to right tilt is easily adjusted by loosening a big nut and just tilting the table. Front to back is a bit trickier, and took me years to notice how... Note the tiny setscrew buried in there, used to push the table up and provide adjustment in that axis. Sneaky. Regrease everything whilst it’s apart. Once the level starts getting really close, you can actually narrow it down best by ear. The scraping of the coathanger changes pitch and noise as the pressure varies. Remember we are building choppers which are really just artistic representations of steel structures - we ain’t building space shuttles!! Dropouts held in and ready for drilling with a nice new 5/8” bit. I need to invest in some better workholding tools, but this does the trick for now. Machine set to the slowest speed (300rpm ish, still too fast) and with of oil, more oil, then a bit more oil.. away we go! 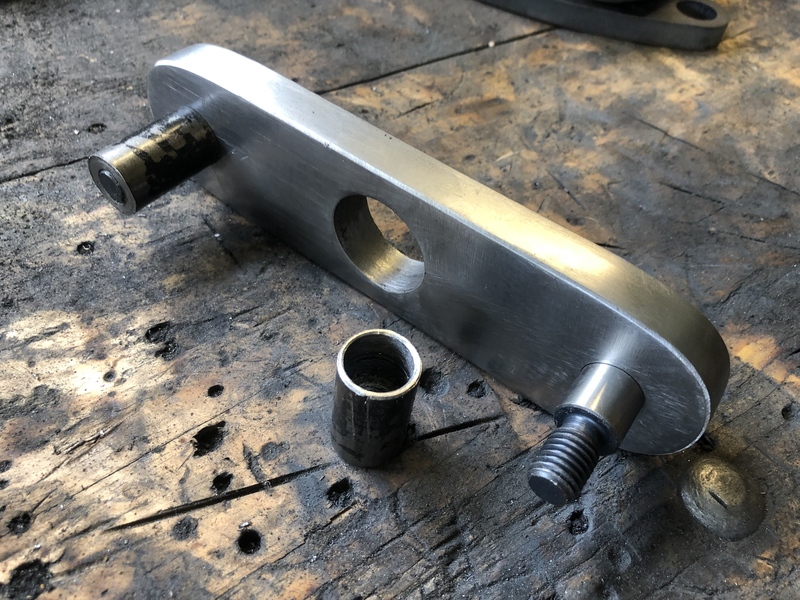 5/8” is 15.87mm or similar, and if drilled accurately will make for a light press fit of a 16mm shoulder bolt. Exactly what I want. Perfect! 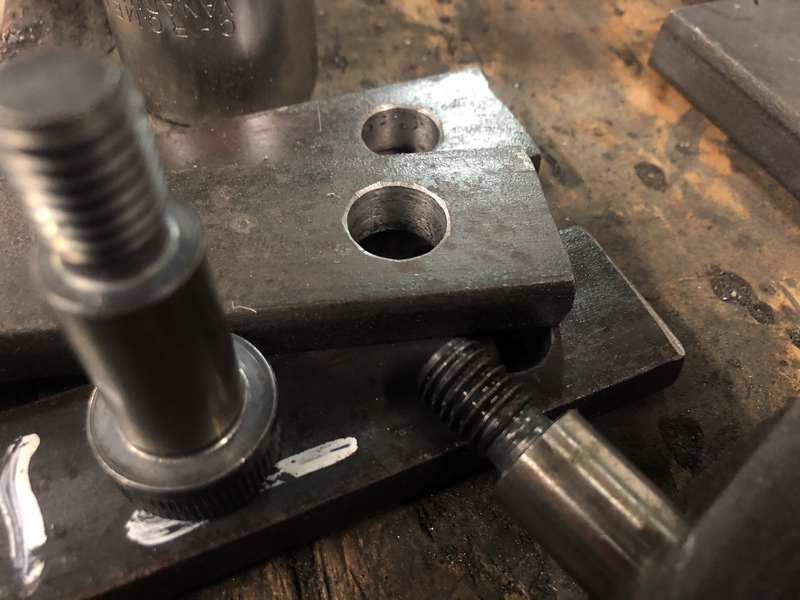 Shoulder bolt pressed in using the vice and a large socket. Result is square and it needs to be for smooth rocker movement and long lasting bushings. I will probably use some bearing mount in the dropout too just to be safe. Slightly chamfered using a bigger bit again. Tip for next time Victor.. drill the holes before you cut the raw material into each part. Much easier to clamp down, and easier to replace if you junk a part. 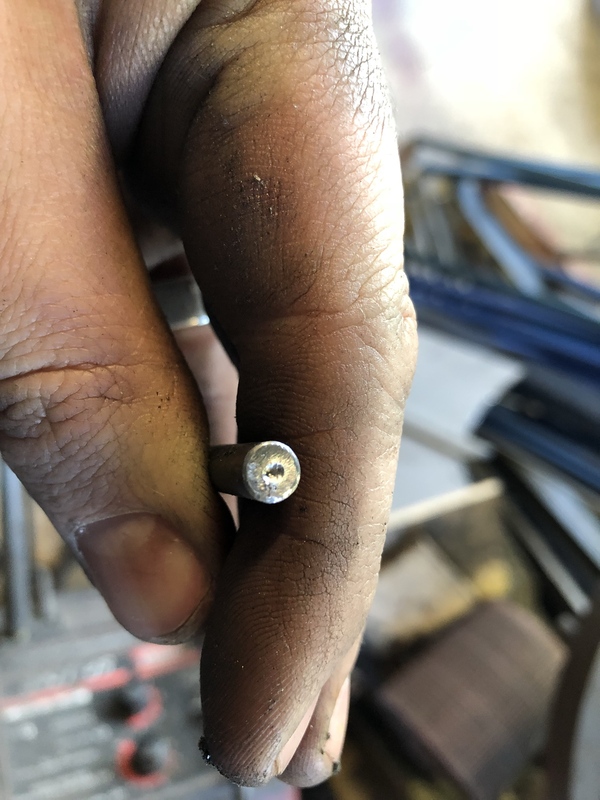 16x30mm shoulder bolt, 12mm bar for the dropout leaves 18mm shoulder remaining. 16mm rocker plus 1.5mm bronze thrust washers will work well. 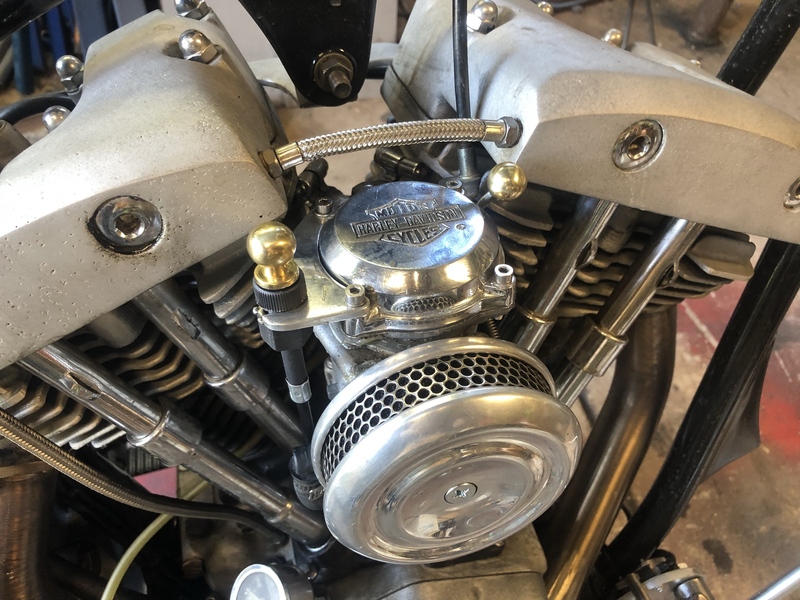 M12 half nut to snug up to the bushings, locked down with a chrome acorn in double-nut arrangement. Locktite too to be safe. I doubt these shoulder bolts will ever wear out, if they do then something has probably gone wrong. 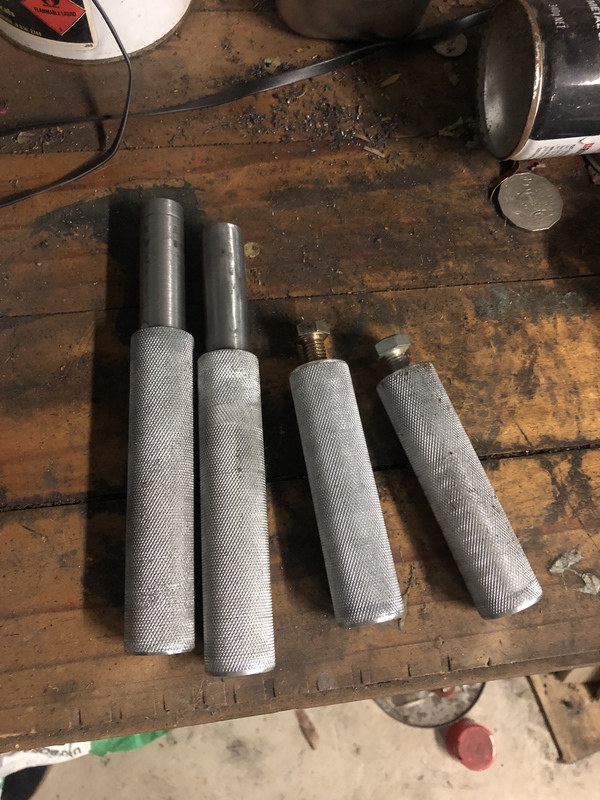 The bushings will wear over time and need to be monitored and replaced. That’s about it for now - sick of writing!!! Great stuff Victor. 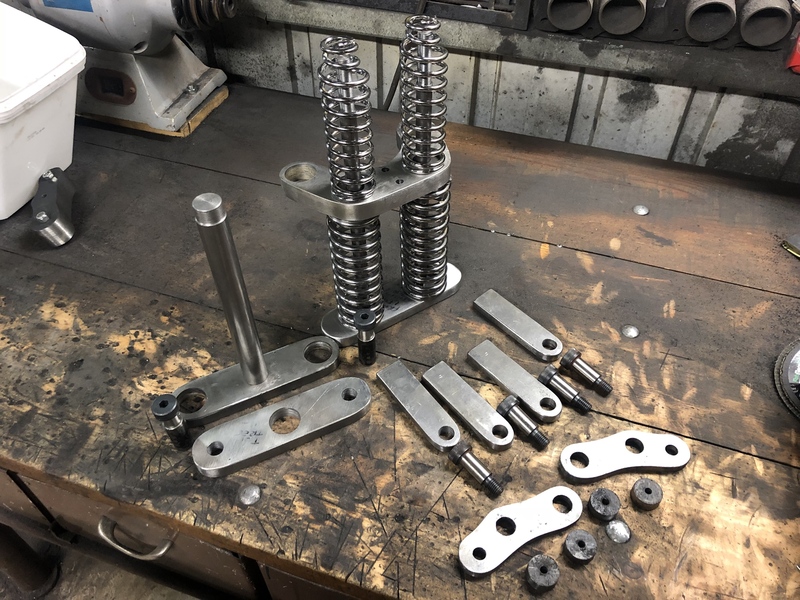 Easy to follow for anyone wanting to build a springer for themselves. 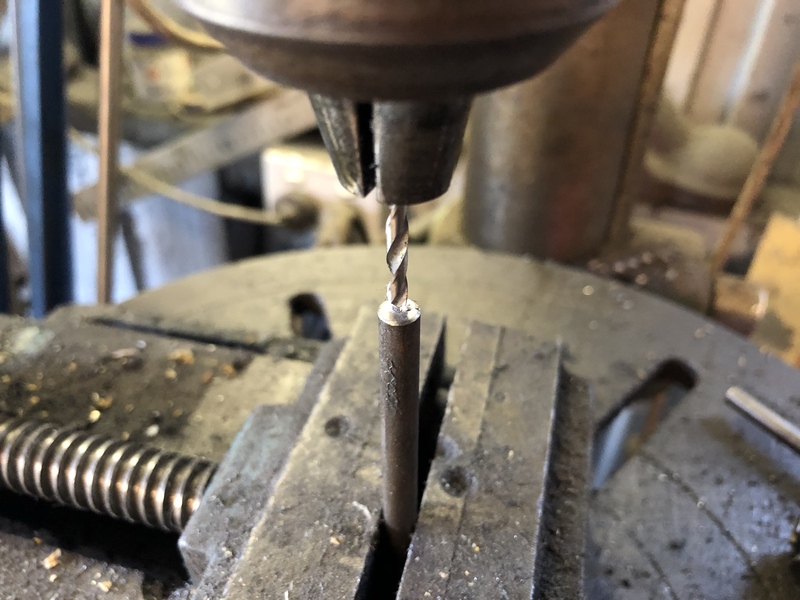 Big challenge for personal workshops is getting the drill slow enough for large diameter bits. You can buy a speed regulator (to wire in) for some types of electric motor. I plan to do it on my mill which is 3 phase, but single phase is possible too. 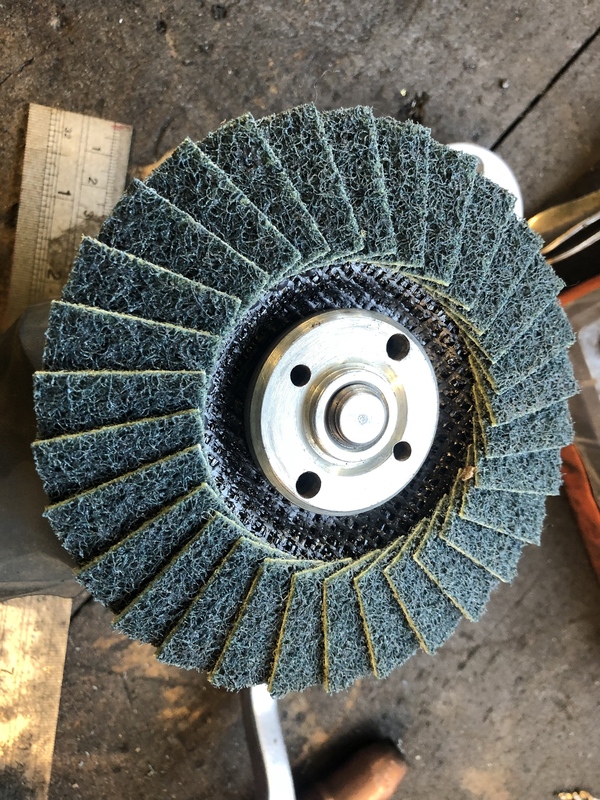 Hole saws are better for the home workshop, but often need some final filing to finish accurately, and can handle the higher speeds a bit better with gobs of lubrication. Oil (or better cutting oil) for steel and kero for aluminium. 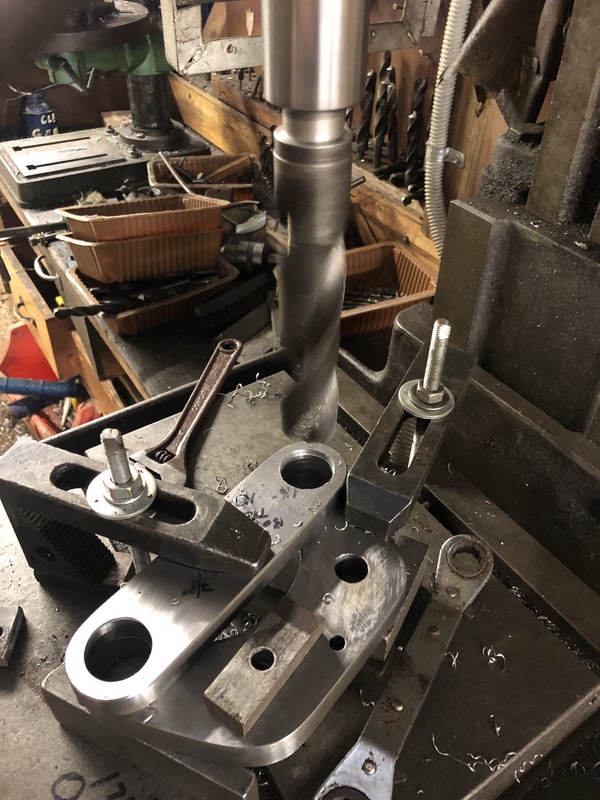 Yes, my drill press goes down to about 350rpm which is still much too fast for these big drill bits. 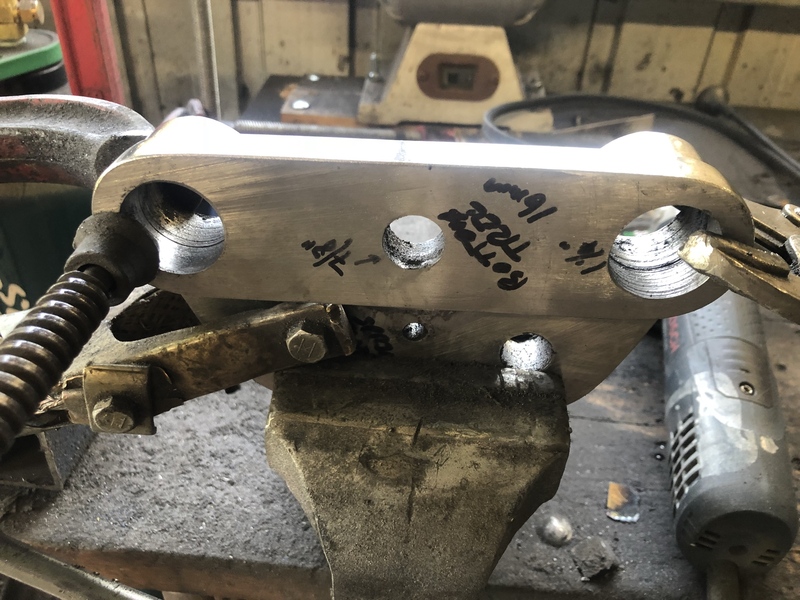 It isn’t ideal for tool life but It’s workable with lots of lubricant, slow speed, and secure workholding. Haven’t got up to much shed stuff lately, this is the last few weeks. First up is the mountings for the top tree. This was Prof’s brilliant idea that will be very strong indeed. These slugs will be plug welded into the 1” rear leg inner tube. 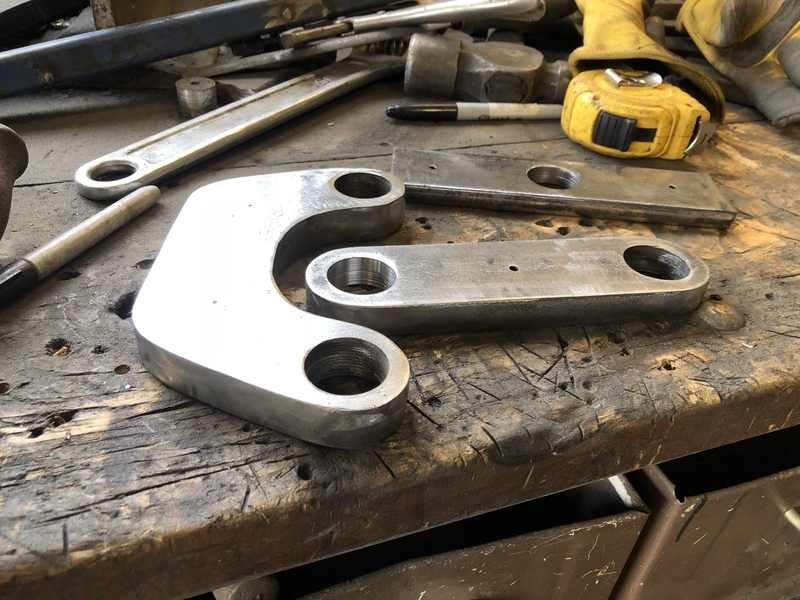 They are counterbored for 16mm shoulder bolts that pass through the top tree. Threaded inside for the M12 end of the bolt. This way all the forces on the top tree are bearing on a 16mm shaft surface instead of just a bolt. Yes I know I’m now using metric fasteners on a American bike... so what. Using hardware that was readily available. 1 extra tool I’ll have to carry in the kit. Top tree marked for standard H-D bar mounts, 3.5” bolt centres. 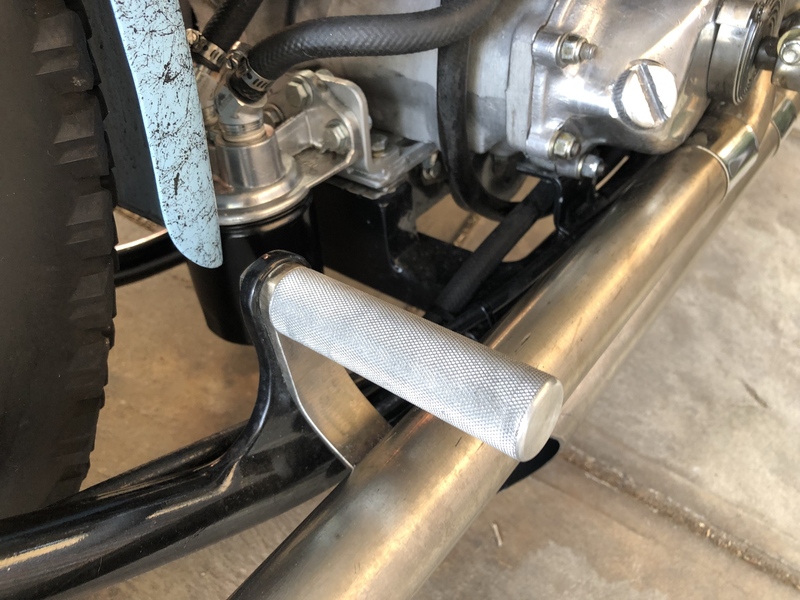 With the assembled fork, there is just enough clearance for a socket head bolt alongside the rear legs. These holes are drilled to 1/2”, bars will be mounted solid. No need for rubber isolators on my bike. Next big step forward... working on the legs now. I started by centre punching the tube some distance up from the end. Using some V blocks, the tube rests in there nicely. Drilling trough the top side is aligned by eye, with the tube clamped down. 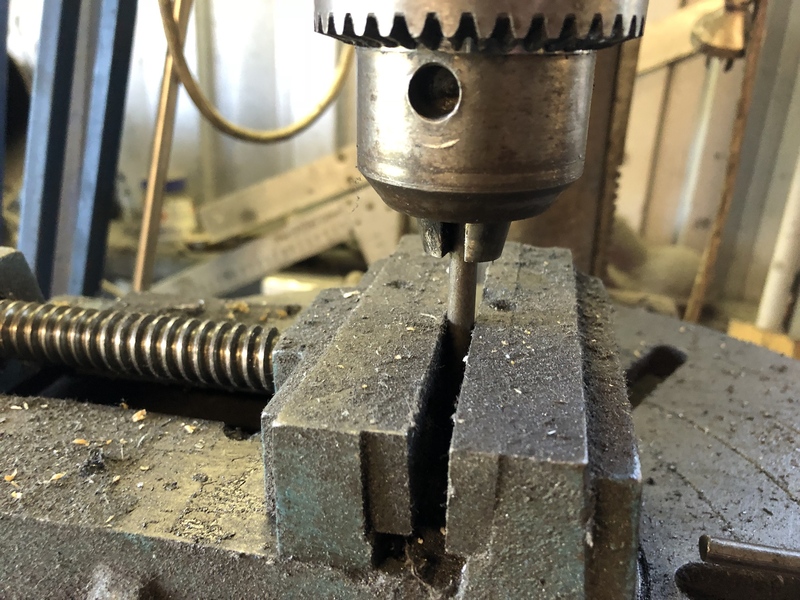 Of course the drill press table is flat, you just want to get the hole as close as possible to the centre of the tube. Drilling through the lower side is where it gets fun. It will self align if you are careful. 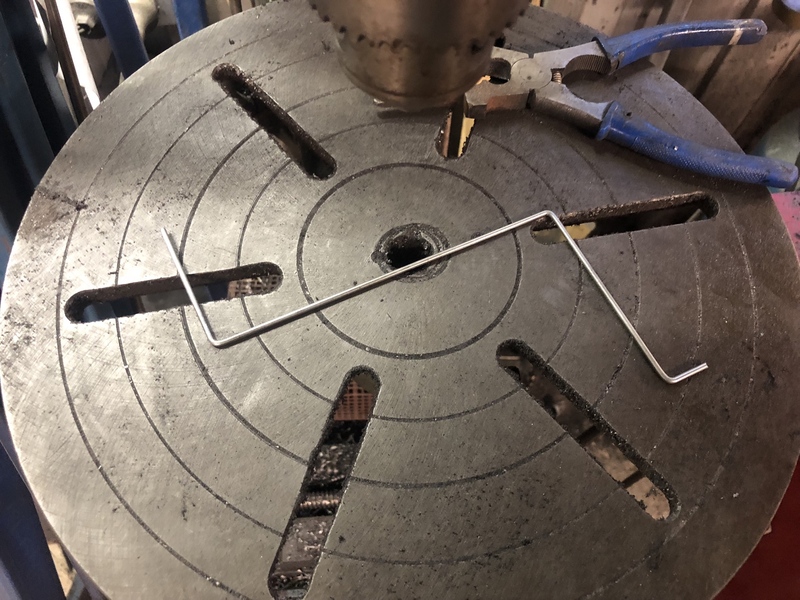 Do not clamp the tube down, just help steady it in the V blocks. 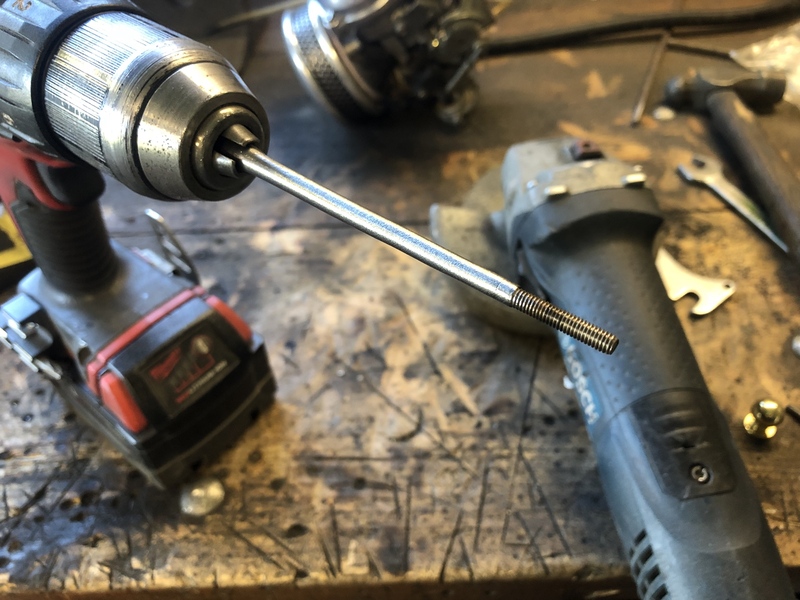 As the tip of a drill bit is tapered, it will naturally guide itself into the lowest part of the tube as it rotates. As the top hole is still located around the drill bit, it will result in a pretty straight and central hole. So long as you take is slow. As soon as the pilot hole is in, step it up until you get what you need. My dropouts are 12mm so I do a 12mm hole. Looking straight through. Note the welding glove to protect the surface whilst in the vice. Lines scribed using a piece of 25x25 steel angle held against the tube, sorry I forgot the picture. This gives a straight edge along the tube to scribe against. Drop out tapped into place. Tight fitting is key, these pieces need to be perfectly parallel to the fork legs, and in perfect alignment on left and right sides. Front legs slotted too. The dropouts for the smaller 1” legs will be shaped to suit. I still need to radius the bottom of them and clean off the mill scale. Here’s a good picture showing the double wall design. I’ve cut the lower ends of the legs at an angle and slightly staggered the inner tube. When ready I will lay some weld over this, and build up a little bit on the inside edge of the inner tube. 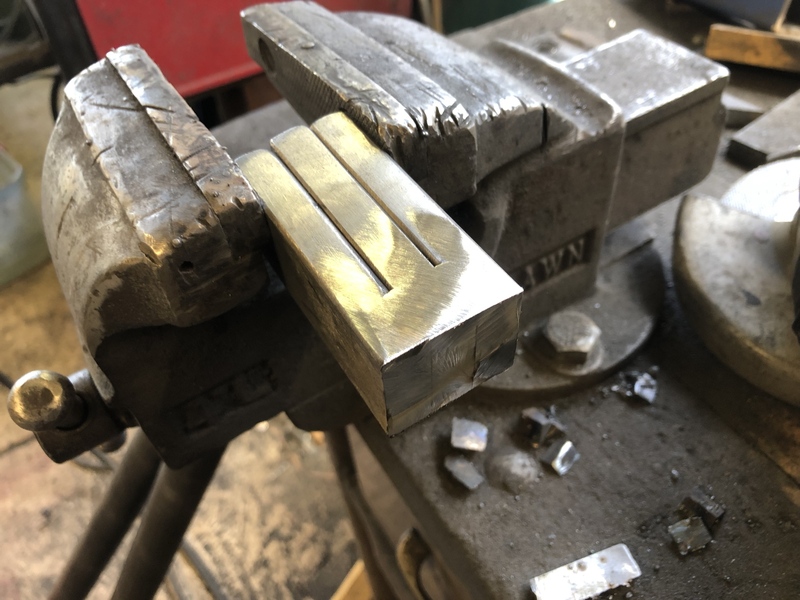 It will all get smoothed back to A smooth angled edge, all before the dropout gets welded in. Radiused ends can be done too, depends on the look you’re going for. Also note the Vee that’s been ground in for welding the drop out. 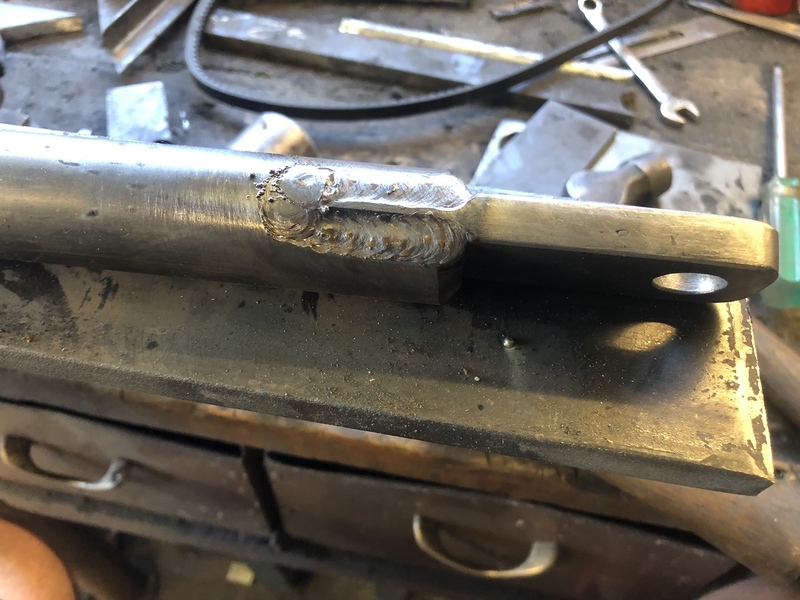 I will take it a little deeper still, once welded in, anything weld proud of the surface gets removed, it will just look like a continuation of the tube. 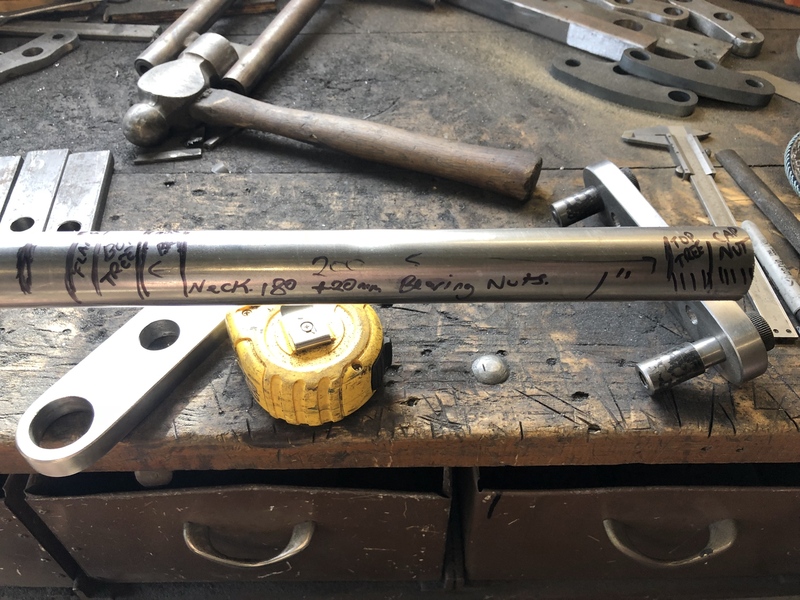 Sketching out my steering stem on some 30mm grade 1020 shaft. I have decided on 200mm between the inside of the top and bottom tree. 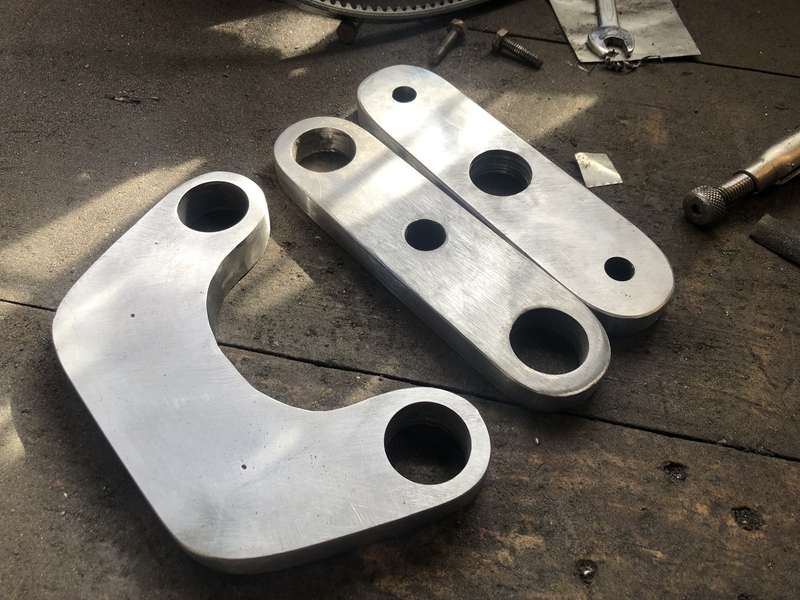 Steering head is 180mm overall length, which gives me 20mm for dust shields (1mm each) and 2x thin nuts to set and lock the bearing preload. 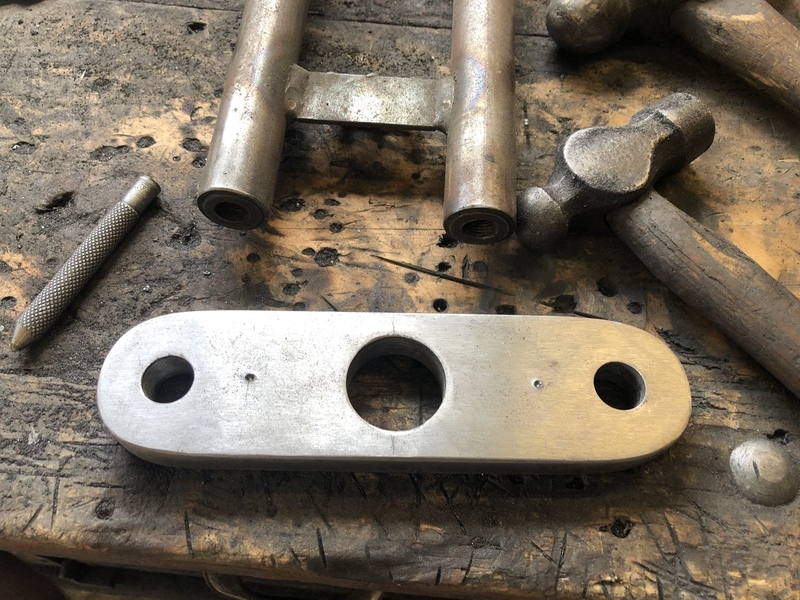 Reason for starting with 30mm shaft is to provide a flange at the base, machine down to press fit into the bottom tree, then turn for mounting the 1” ID bearings. Bottom bearing should be a tight fit. Top bearing needs to be snug in but still be removeable easily. Of course after turning to shape, 1” threads need to be cut into the top end, a job I will have to farm out probably. 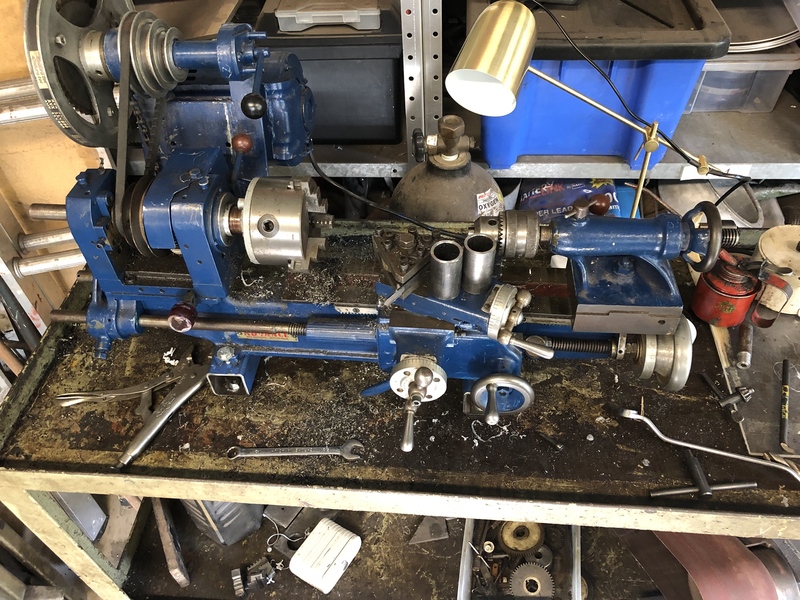 Recently picked up this old Lathe. It’s an Advance, made in Melbourne many decades ago. It’s only a small one but will really come in handy around the workshop. So nice to have a some turning capability in house, and this one runs really nicely. Next thing was to take out the neck stem hole on the bottom tree. It had been drilled to 22mm as I was originally going to bolt in the steering stem. Revised this plan as detailed above, decided on 26mm for the new hole dia. I don’t have any drill bits this big. The tree wouldn’t clear my lathe bed to bore out the hole. Time to get creative. 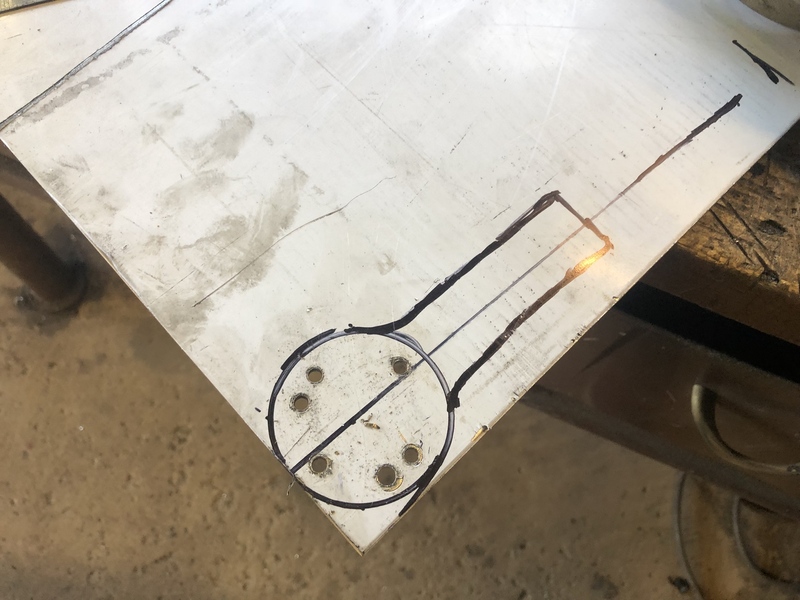 After recently levelling my drill press table, I know it’s accurate. 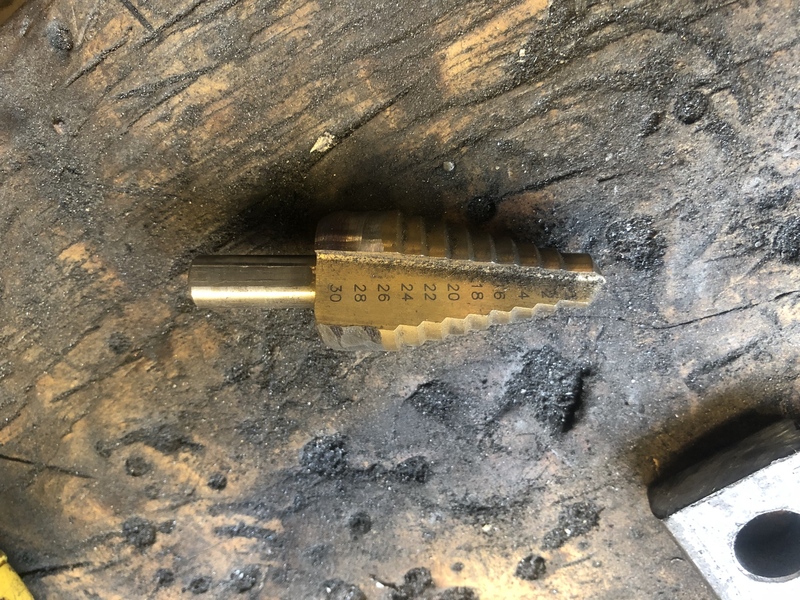 Step drills are a great invention, I have a couple, hrmmmm there’s a 26mm step... a few minutes on the bench grinder turns the 28 and 30mm steps to dust and now I can drill 26mm holes!!!! Boom! Surprisingly nice bore finish too. Lastly, I have been watching YouTube videos of people polishing Axe heads. Exciting I know... but it has reintroduced me to the orbital sander. 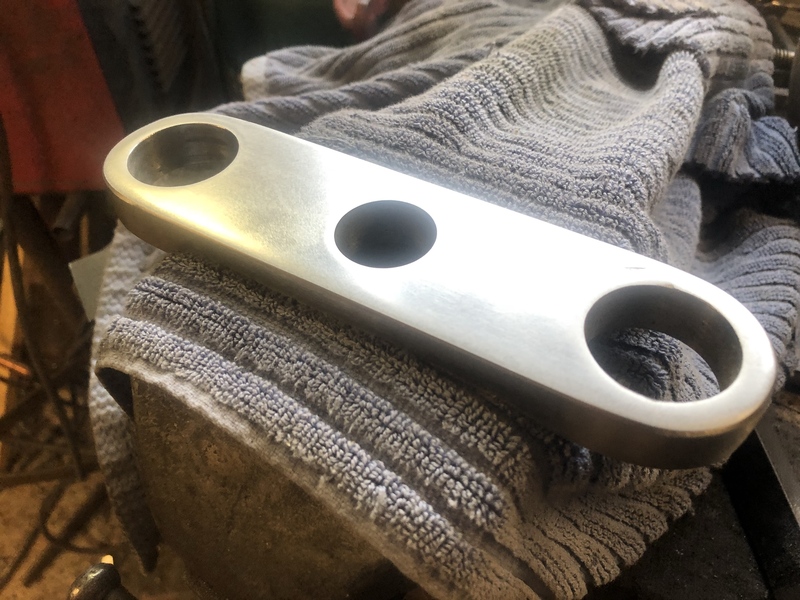 This is my first time doing proper metal ‘finishing’ and I am finding it really interesting, and time consuming. Where this was once just a hunk of flat bar, i now have to be careful handling it as it scratches so easily. This is the result of 240Grit on the orbital sander, using some RP7 as some lubricant. I still have some deeper scratches so I’ll be going back to 120G and starting again. It all works quite quickly though and the finish is great. From here I’ll go up through the grits till I get a nice shine. 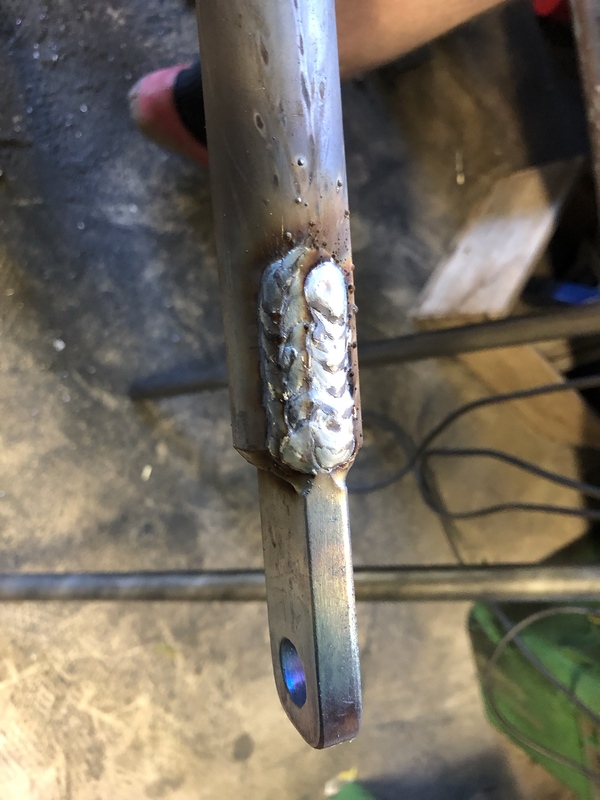 I have also been researching fillet brazing, and the possibility of TIG brazing. 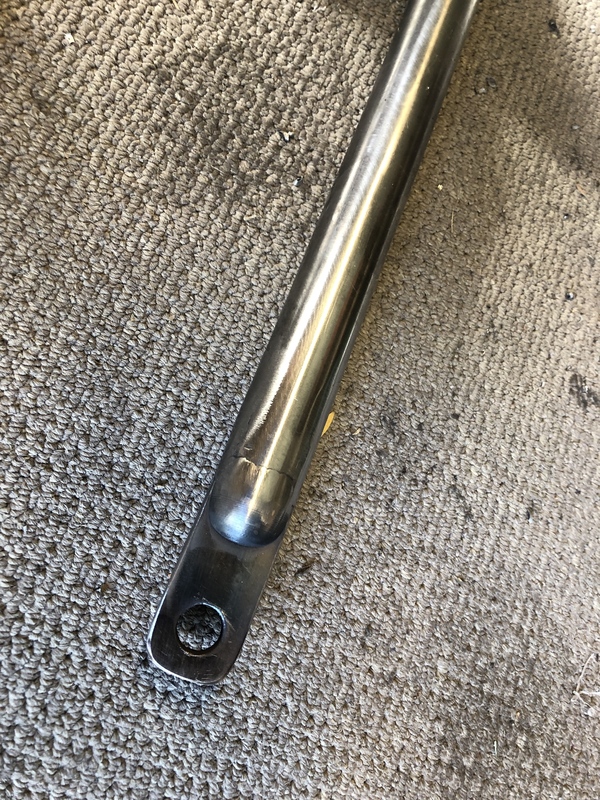 I intend to braze all the tube/tree connections on this fork, but it’s a skill I really need to learn first. 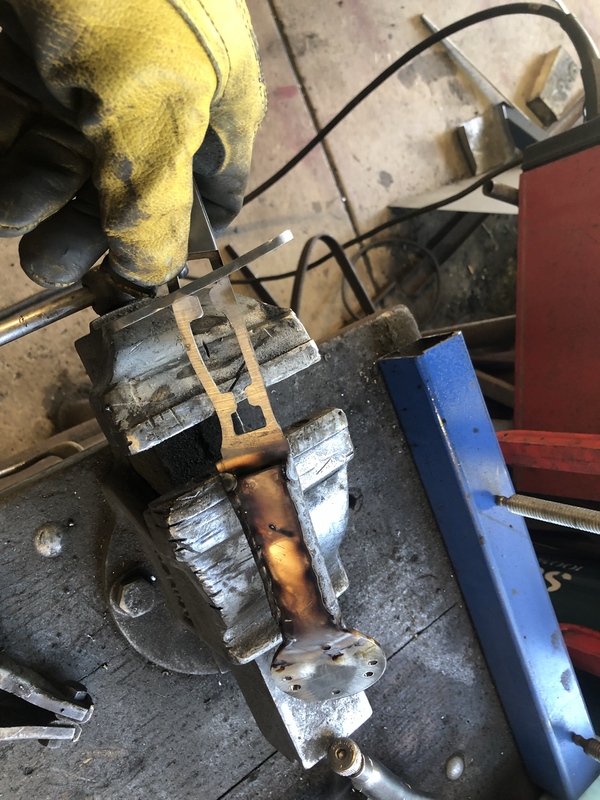 By design, weld strength at these joints is not critical, the fork is actually rigid without any welding/brazing, it all needs to be tapped together with a hammer. 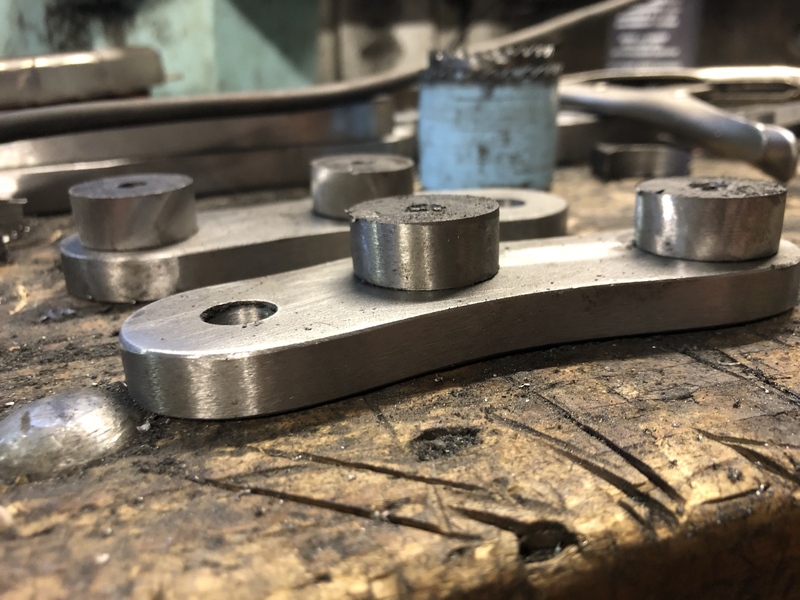 Braze has the advantage of not affecting the base metal or creating a heat affected zone, significant advantages for this purpose. 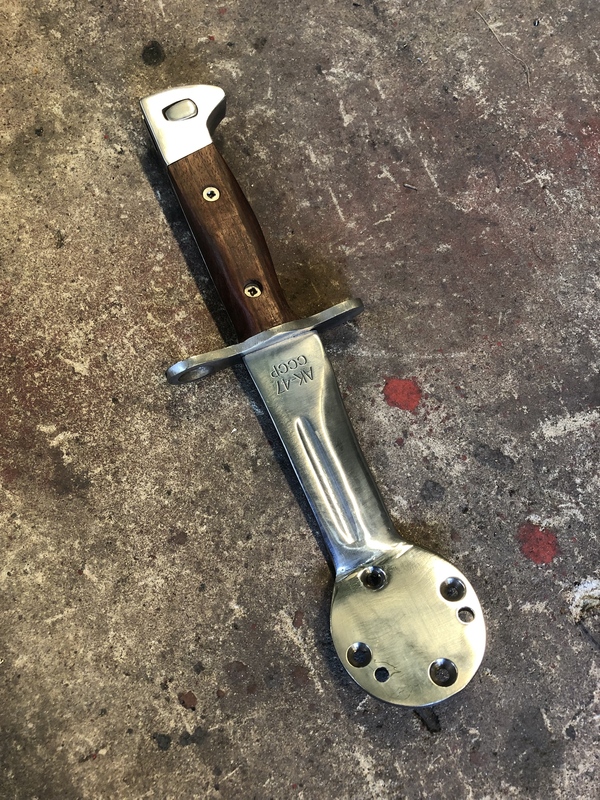 There is some amazing looking fillet brazing in the bicycle world. The Ariel Atom car is also built by fillet brazing. I’m kidding myself if I expect results like that overnight though. Dropouts will be mig welded and smoothed back. Haven’t decided on the plan for for front leg spring bridge yet, but have a few idea. That’s all for the today.... and probably the next few weeks. I missed this picture, this is the bottom tree straight off the linisher, before the 240G on the orbital. 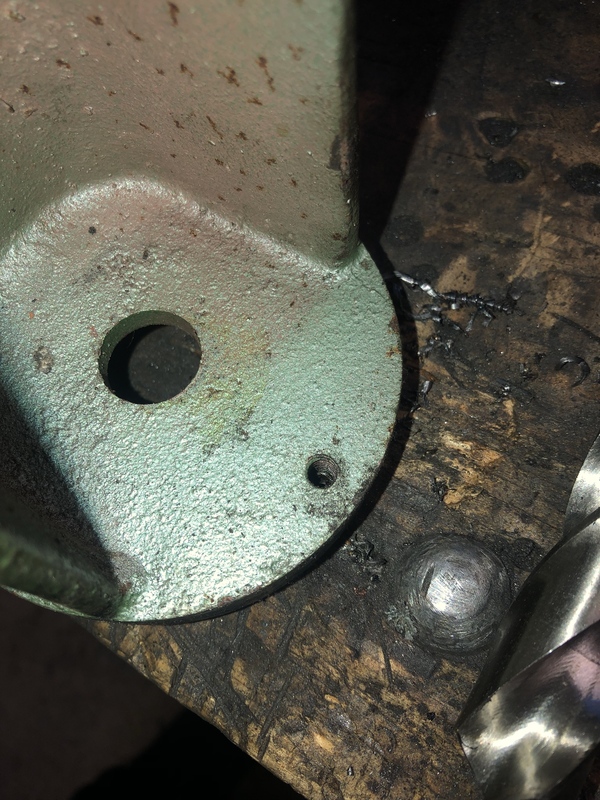 Keep in mind this is just regular mild steel flat bar that had nasty mill scale all over it. Good to see the progress and the lathe. You will be amazed at how much you use it... and wonder how you ever got along without one. Re top 1" thread...1. It doesn't have to be one inch, can be stepped down. 5/8 would be adequate, as it is basically just acting as a lock nut. 2. I have 1" UNF dies and you can use my larger lathe to get it started straight. Thanks Prof, I’ll take up your offer the 1” die. A crazy week was had so spent the day today in Shed Therapy mode. 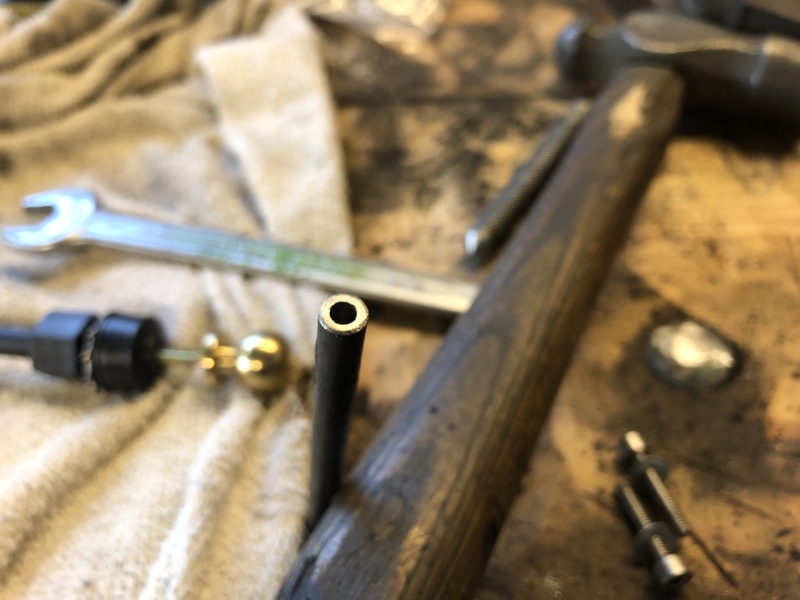 I revised my plan of terminating the tube ends, cut them square and ground a bevel prior to inserting the drop out. Heavy V-ing here to get the weld in deep, any weld proud of the tube is removed. Root pass providing all the strength, but it needs building up to match the tube diameter. Easily done with the Mig. It doesn’t look the best, but most of it gets removed anyway. Strength is key, even then the forces at the lower end of a springer don’t seem to be that significant. 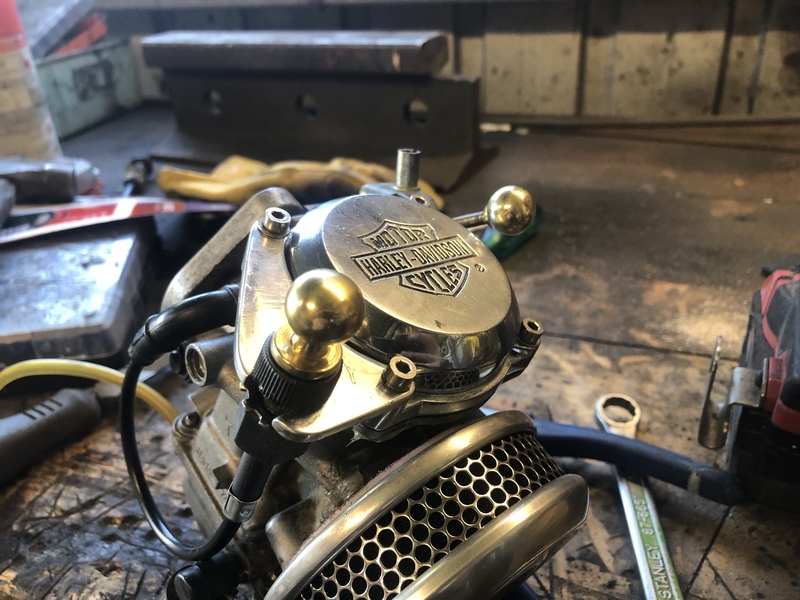 Many old custom springers, and even factory Harley springers were just flattened tube. Next thing is to finish the tube ends. I activated my brain for a brief moment and came up with this. 3 pieces of 12mm flat bar tacked together, 12mm being the thickness of the fork dropout. 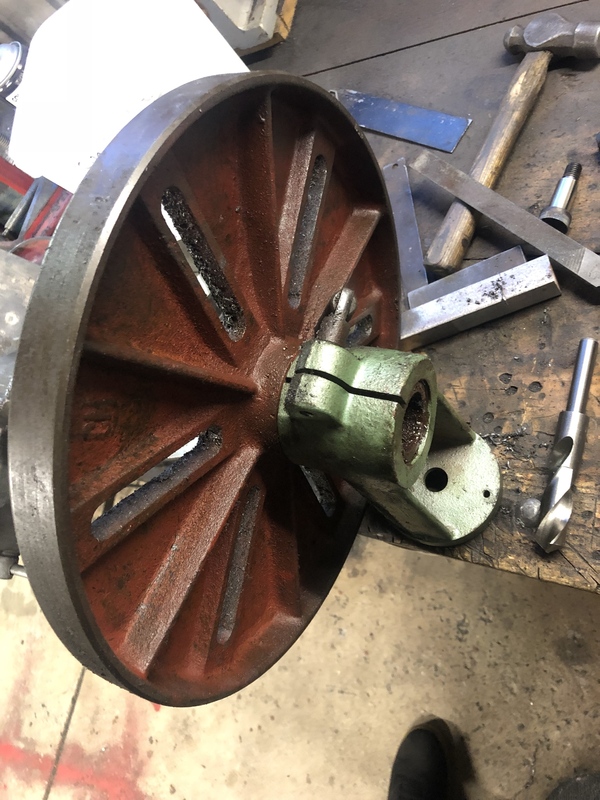 Then mounted in the 4 jaw chuck. 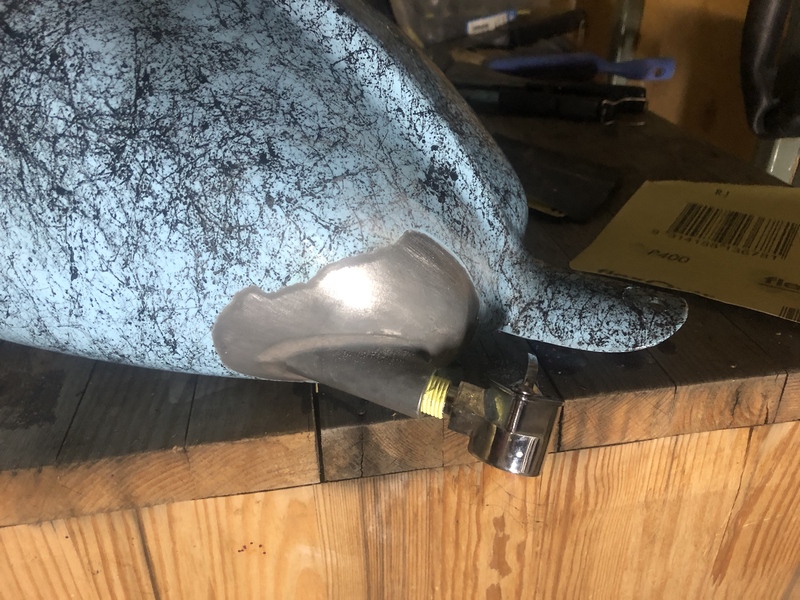 You can see that I’ve smoothed down the bulk of the weld and welded on one of the half domes around it’s circumference, but not across the curve. 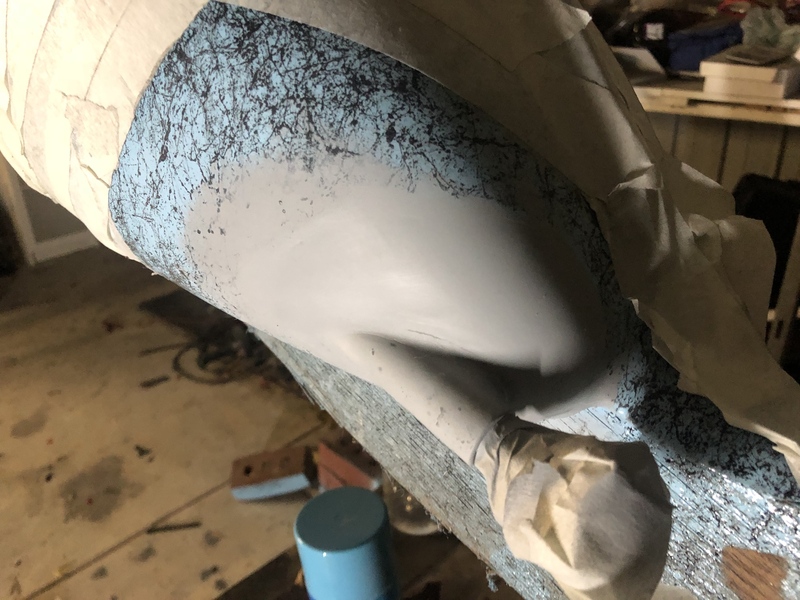 This whole leg will be put in a lathe and skimmed down smooth. 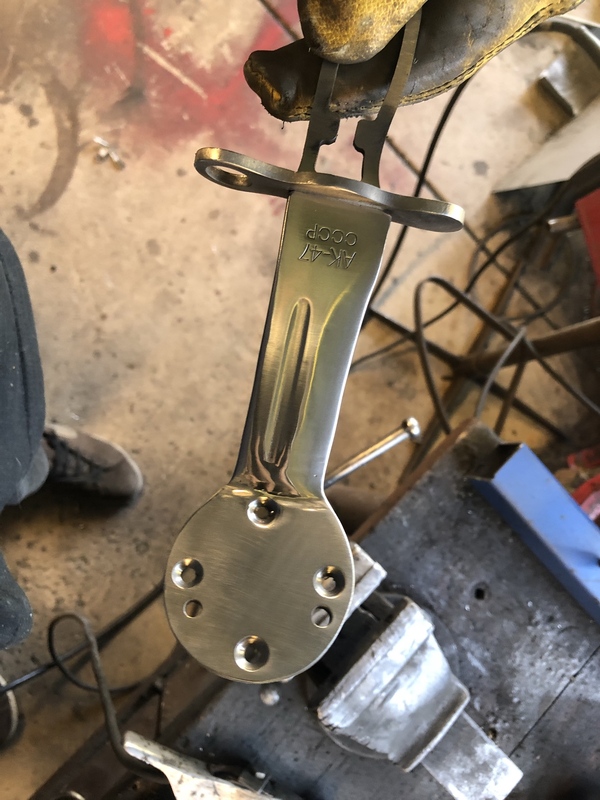 The un-welded part here, and the joining of all the major fork parts I have decided to do in bronze.